Can there be a cookie of the year? Sure, it’s possible that I spend too much time consuming food media, the takes, the Tweets, the Instagram Stories. But if I didn’t, I wouldn’t have seen Alison Roman’s Salted Butter and Chocolate Chunk Shortbread Cookies virtually everywhere, weakening my resistance to the point that I had to try them, and when I did, realizing that just in case you’d missed them on, like, Refinery 29 or Eater or in her incredible first cookbook, I had to tell you about them because they should not be missed. Roman’s book, however, was not new to me. I was lucky enough to read it the moment it was ready and it instantly became a favorite. If you saw me on book tour asked me what cookbooks I was into this year, I guarantee it came out of my mouth first. Roman has done stints at Milk Bar and Bon Appetit and writes regularly for the New York Times food section and her recipes show: she knows how to make the food we really want to eat. She’s also a sharp writer; I love her love letter to boiled potatoes. There wasn’t a chance I was going to miss the Roasted Broccolini with Lemon and Crispy Parmesan, Caramelized Winter Squash with Toasted Coconut Gremolata, Cucumbers and Kohlrabi in Crunchy Chili Oil, her whole section of Knife and Fork Salads, not-the-usual fruit salads (i.e. all savory), her Whole Wheat Pasta with Brown-Buttered Mushrooms, Buckwheat and Egg Yolk, Baked Pasta with Artichokes, Greens and Too Much Cheese and do I have to stop here? I don’t want to stop here but I’m getting close to just copying and pasting the table of contents. But the single dish I did not expect to make were these cookies and their full title — Salted Butter Salted Butter and Chocolate Chunk Shortbread, or Why Would I Make Another Chocolate Chip Cookie Ever Again? — might explain it. She says she’s always found chocolate chip cookies to be “deeply flawed” — “too sweet, too soft, or with too much chocolate.” She thinks “there’s a lot of room for improvement.” I am that scream emoji. I feel protective… of a cookie. Roman instead took all of her favorite parts of classic chocolate chip cookies to invent something else entirely. First, she uses lots of salted butter; she says that while she prefers unsalted butter in almost all baking, here, it’s deeper flavor and saltiness, add more complexity than just adding salt to unsalted butter. There’s just enough flour to hold it together, just enough brown sugar to suggest a chocolate chip cookie, and chunks of irregular chocolate pieces to “prevent chip congregation” (although, warmly, let me suggest that only a monster could hate such a thing). The dough is formed into a slice-and-bake log that you roll in crunchy sugar. The first time I made them, I quick-chilled the log in the freezer and sliced a few off to bake them and thought they were good, very good, even. But a few days later I sliced and baked off the rest (though I think even a day would work) and baked it for one minute less and you guys need to come over right now and take them from me. We put them on a high shelf so we’d forget they existed and then I started editing photos of them and writing about them this afternoon and have since eaten two more. They’re buttery, so buttery, and a bit crunchy (my husband calls the edges that slip onto the pan “sugar frico”), and salted in that flavor-deepening way, not just an flecky afterthought, and they’re going to win at parties this weekend should they survive that long. Roman says that if you find it annoying to buy salted butter just for this recipe, you can use unsalted and add 3/4 teaspoon kosher salt instead. I would like you to know that if you’re buying European butter (and oh, if there was ever a time to splurge on it, it is here) in European packages, most will come in 250-gram blocks which is (drumroll) within 5 grams of what you need here and the recipe works perfectly even without this 5-gram pat of butter. Beat the butter, granulated and brown sugars, and vanilla with an electric mixer until light and fluffy, scraping down bowl as needed. Add flour, and mix just until combined. Add chocolate chunks, mix just until incorporated. Mixture will look crumbly. When you’re ready to bake the cookies, heat your oven to 350°F. Line one or two large baking sheets with parchment paper. Lightly beat the egg and open up your chilled cookies logs to brush it over the sides. Sprinkle the coarse sugar on the open paper or plastic wrap and roll the logs into it, coating them. Using a sharp serrated knife, cut logs into 1/2-inch thick rounds. You’re going to hit some chocolate chunks, so saw gently, squeezing the cookie to keep it from breaking if needed. Arrange cookie slices on prepared sheets one inch apart (they don’t spread much) and sprinkle each with a few flakes of salt. Bake for 12 to 15 minutes, or until the edges are just beginning to get golden brown. Let cool slightly before transferring to the cookies you don’t eat immediately to wire racks to cool. Do ahead: The dough can made ahead and stored, tightly wrapped in plastic, up to 1 week in the fridge, or 1 month in the freezer. Baked cookies keep in an airtight container for 5 days, or so I’ve heard. I couldn’t help myself! Dough is in the fridge. I used TJ’s chocolate chunks (already had them) and will report back. FYI, both Plugra and Kerrygold’s salted butter bricks are 227 g.
Yes, yes, but my store sells some butter in European-sized packages, which are 250 grams — I used a brand called Chimay — so I just wanted to mention it. Deb I live in Chimay, it’s funny to see you use a butter that comes from Belgium and especially from my hometown! Hope it’s a good one, I buy another brand (shame on me). For reasons we do not understand (or maybe want to), our store sells this for less than it sells American butter in sticks, thus we use it always. It’s definitely better than American butter. Can you help settle an argument with my husband: is this the same Chimay as the beer we like?? Yes it is! I guess since they export a lot of beer (we call it trappiste) they throw in some butter when they ship… maybe that’s why they’re not that expansive. Anyway, I’m glad it’s good! baked these today – they are scrumptious and look just like Deb’s. 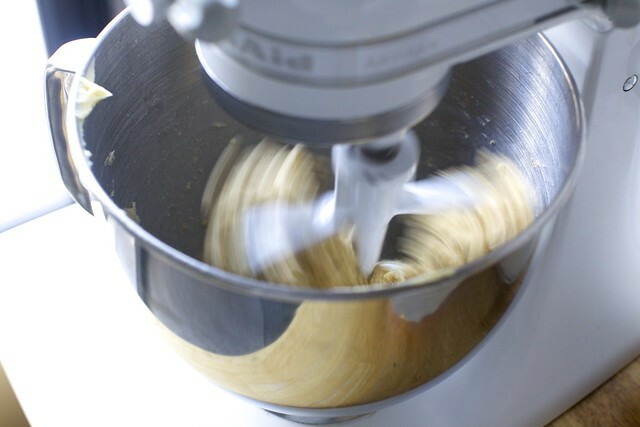 Some tips for those who had crumbly dough – you absolutely have to mix the butter and sugars at med-high to high speed for 3-5 minutes until the mixture is fluffy. Stand mixer is preferable. If it hasn’t aerated properly, and gained enough volume, it won’t be able to properly incorporate the flour and will be too crumbly. 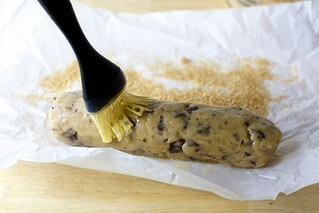 I found the dough to be a little crumbly, but I was able to easily massage it into a dough log with plastic wrap. and refrigerated for 24 hours. I used European butter. I also wonder if people aren’t using enough butter? If I did the math right it calls for 18 T (so, one full US-sold Kerrygold plus 3 T). That’s what I used and it worked. Sorry for all the comments – but I just used the T markers on the Kerrygold package and a stick of butter; I didn’t weigh it. So mine may have been less precise on the excess side. Made these today. Thanks for the butter/sugar beating advice. Mine were just slightly crumbly, but not nearly as much as when I make pie dough. The cookies turned out just like Deb’s and they are the perfect combo of shortbread and chocolate. I’m going to try to freeze them to prevent myself from eating them all. Follow up to earlier comment … they freeze beautifully. I am going to make my next batch with smaller diameter logs. I found the cookies deliciously rich to the point that they could be a bit smaller. Benefit will be more cookies per batch. How can I save a log that is very too much crumbly??? I’m heartbroken. Had it in the freezer and it’s still just crumbling. Can I take it out of the freezer & add some some somewhat softened butter? Heeeelllppp please!!! Let the dough come to room temp, add 1-2 tbsp heavy cream remix just until it comes together loosely. Reshape into logs and refrigerate until firm. Slice & bake. They might be a little less “shortbready”, but still very good. I only have a handmixer these days and so my dough was crumbly, but I was able to bring it together with my hand very easily in the bowl. I then refrigerated the logs of dough overnight, and was able to cut them with a serrated knife fairly easily. The chunks of chocolate made a few of them break apart as I cut them, but they were easy to push back together. My dough is so crumbly that I can’t form it into a log….any suggestions? Should I add a touch of water to it? I’ve made a few batches of these cookies and each time the dough is crumbly. *I only own a hand mixer. It easily incorporates into a log with a little hand massaging. The crumbliness is what makes the layers of butter, flour and sugar create such a yummy dough. I hope this helps. I use slightly softened butter and beat the dough for a while, it was perfect. Just want to clarify since I’m following directions to a tee and the dough is still too crumbly— you beat the COLD butter and sugars for 3-5 mins? I definitely did that. You had me at shortbread. Yum! This is happening tomorrow. Happy New Year! If only I saw this recipe earlier … going across the street soon for a smorgasbord party. I made gravlax – but sweets are ALWAYS the best in my book! PS my husband and I just had salad – kinda afraid of the food (smorgasbord ????!!!) – so I plan on eating HEAPS of dessert! Partaaaaay on! Happy New Year! So…what do you do with the egg? I am glad I read your comment, or I might have put it in after the sugars! Haha – I almost did the same thing! People. I literally looked at the picture and then made the cookies, without doing any reading. I thought they were salted butter-cookies and not salted-butter cookies. I rolled the damn things in salt, and did not use salted butter. And I ate them all. hahaha. oh craps. i usually put egg into the mixture. but not this one!! i guess because shortbread cookies don’t have egg in it! Me as well. I read Deb’s recipe and was like, ‘What the heck don’t I need to add the egg before the flour?’ Then I pulled out Roman’s cookbook and realized it is used only after the dough has chilled. Shame on me for doubting my favorite food blogger (perhaps favorite adult person generally). Can’t wait to dig in. 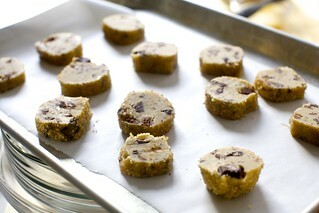 I feel the same way about chocolate chip cookies, too sweet all around and I cannot wait to make these! I just remade the ginger cookies from last week. Will definitely be trying these but ma’am you are the devil with cookies. I don’t think you’ve baked a cookie I didn’t like. How did I not know about this “cookie of the year?” I am behind on most news, but usually on top of cookies! I think this means I’m going to have to make three Smitten Kitchen recipes in 24 hours. I made the perfect blueberry muffins this morning and a cranberry white chocolate version of the two cookie recipes from the new book. Both outstanding. I recently read an ATK cookie recipe that suggested using a lower protein A.P. flour than King Arthur for making cookies. What is your favorite flour for cookie baking? I’m not Deb (OBVIOUSLY) but I always use Gold Medal bleached all-purpose flour. I grew up baking with it and never saw the need to do anything else. Stella Parks totally preaches using the same flour – KA flours have too much protein for good cookies (but love their flour for making bread). I have been using KA forever and did so here, no complaints, but I did read this morning that Stella Parks/Bravetart also likes the lower protein Gold Medal All-Purpose — bleached, even. She says that it’s not, in fact, bleached but a bit of marketing that makes unbleached sound better (I’m paraphrasing but find this fascinating). If you can find it, there are a few places online that sell it, I prefer using French T45 or T55 flour for things like this. The T45 is very finely milled, the T55 slightly less so. The difference using French flour vs. American is subtle but noticeable, better texture and flavor. Happy Holidays to the fab Perelman four! I must be a weirdo because I hate baked goods made with unsalted butter. They taste really flat to me, even when salt is added to the recipe. As such, I’m all over these! Me too. I always use salted butter for baking. Mostly because I don’t want two types of butter taking up room in my fridge. I bought unsalted once by mistake and the end result tasted flat, just as you said. Me too. I did a double take at the “if you find it too annoying to buy salted butter”, because I never buy unsalted butter. I think it’s icky and it reminds me too much of Crisco. I’m an occasional baker, and have never had a problem using salted butter. Ditto…I have never bought unsalted butter. Sometimes I add a bit less salt to the recipe to compensate, but what do these people who buy unsalted butter eat on their toast? Sheesh! Salted butter is the best! Thank you, guys!!! I thought I was the only one who uses salted butter in all my baked goods. I don’t believe I’ve ever bought unsalted butter on purpose. I’m also reminded of shortening when I taste it. I usually leave added salt out of recipes and just rely on the salt in the butter, or add more to my serving if it’s a savory recipe [my husband has high blood pressure and I have low, so this is habit for me]. We buy salted butter for our toast! I am afraid to look in my freezer to see just how many kinds of butter…salted and unsalted…that I have right now!! Agreed! I actually thought it was Smitten Kitchen who, a while back, said we should really always be using salted butter for baking. Anyone else remember that? And hear, hear to the comment about butter and toast! I’ve definitely suggested in the past! But I do tend to default, when developing recipes for others, to unsalted just for consistency. These seem for all the world like a blond version of Dorie Greenspan’s world peace cookies (which we love in my house). Can’t wait to try them. Oh hell yes! I looked up Alison Roman after you mentioned her in DC. Thanks for the rec! I used the Eater recipe and baked the first log a couple of days ago and now that those are gone, I’ll be breaking into the second log in the freezer. Good to know that a little rest makes them even more worthy of hiding on a high shelf (and from my coworkers)! I’m interested to know if the freezing/extra rest will help keep their shape better with less spreading? The slices from the first log didn’t hold their shape despite an overnight chill. And I noticed similar results on Alison’s instastories/reader highlights. I just saw an instagram story by Alison Roman, she said if using a hand mixer, use softer butter since hand mixers aren’t as strong as stand mixers they need a little help along the way. Also after adding the flour, use your hands to knead the dough instead of the hand mixer. Knead until it resembles play doh. She said this should also help with the crumbly dough problem others have mentioned too. I haven’t tried it myself but I hope that helps! thank you for the advice ! Was contemplating making those for tea but I was afraid of screwing them up completely due to my lack of stand mixer. I am just an occasional baker so always a bit scared to experiment in this department. Will be trying out this method today ! I am always unsure what kind of chocolate to get. I understand chocolate chips and baking chocolate, but I’m so unsure when it comes to chocolate to cut into chunks like this. Any suggestions on brands/where to find in the store (baking aisle v. candy aisle)? Trader Joe’s has chocolate chunks that are already cut up for you and perfect for a recipe like this! I honestly am disappointed whenever I make a chocolate chip cookie with anything else. My husband just made these and they are right up there as one of the best cookies ever! He used the chocolate chunks from TJ. Super delicious! Going to bed now so I don’t eat all of them. Honestly, whatever you have. I had a few chocolate samples I was lucky to come into on book tour and used a few of them, plus the end of a block of Scharffen-Berger. I often use Trader Joe’s pound-plus bar when I need chopped chocolate; the price is great. But in a pinch, I’ll get a couple Ghiradelli bars from the bodega. Long-time listener, first-time caller here. My sister told me a few years ago that she uses salted butter in baking, and I started doing it recently. I really think there’s something to it for tastes like mine, where I want all things to taste more buttery and more salty. Salt tastes like butter when it’s in sweet things, and for me, that’s a value add. I know you’re not supposed to, but it works for me so there you go. Alison Roman is a favorite of mine, so I’ll try these. I really started making serious cookies this Christmas. I usually cop out and just make sugar cookies. This year, though, I tried Dorie Greenspan’s World Peace Cookies, and these remind me of a sort of butterscotch version of those. Sounds great! Would you use baking wafers in these or would they be too uniform? I would, but I’d give them a rough chop first — I’m assuming you meant the Guittard ones that are maybe 3/4-inch wide. I was going to make yet another peppermint thing for a New Year’s party but these seem just right. Thank you! Now this recipe is worthy of an ode!! I am definitely going to make this and as I mixing all the ingredients I will try to find the words of praise that this delectable treat deserves!! Yes!! A cookie of the year. Happy New Year, Deb, to you and your lovely family. Thanks for sharing all of your cooking adventures. It’s been a pleasure to follow along. I got that book for Christmas and it’s got a ton of flags sticking out of all the things I want to make. These may have to happen today just for fun. Deb, in your haste to get these into the oven you forgot to tell us when to add the egg. I assume after the initial “light and fluffy” stage? Looks to me like the egg comes in at the end as a wash to make the sugar stick to the outside of the logs before they’re cut into slices. Deb, oops, in my haste to get these into the oven, I overlooked the step that says to beat the egg and brush on the log sides before rolling in sugar. My apologies! Definitely making these & using my airplane shaped cookie cutter, sending the results as a congratulatory acknowledgment to a friend who recently received his PPL (private pilot license). Gotta, gotta, gotta make these! Am always on look out for the best chocolate cookie recipe and this just might be it! Gotta, gotta, gotta make these cookies! Like as soon as I get home! I am always looking for the perfect chocolate cup cookie and this might be it! Haha! That reminds me of that Frog and Toad story in which Toad makes the Most Delicious Cookies ever, and they can’t stop eating them, even when they hide them in a box, or up in the high cabinet. Can these be maxe in the food processor? I love love love salt, but I always buy unsalted butter because I have been told that the salted stuff may be inferior to the unsalted. Untrue? I’d say it’s the opposite. In fact, salted butter is supposed to stay fresher longer because salt is a preservative. That is an interesting use of “fresher”. I think the fact that an item is salt-preserved means that it will generally be held on the shelf longer. Whether there is a meaningful decline in taste is up for argument; but it seems odd to consider such an item “fresh”. My friend is having a New Year’s Day open house and that’s the perfect excuse for me to make these. I’m hoping I can hold out that long. “Chip congregation”…really? I would not hesitate to make this with plain old chocolate chips…mini might be better, but if you give the chocolate chips a good chop through all should be good, I think. Come on…this is one thing I would not worry about and I bet the cookies would turn out fine. But then, once baked I, who must be a chocolate infidel can’t tell the difference between Guittard and Nestles either. Honest! Is there any way to salvage dough that crumbles to bits when I try to cut it into cookies? This happened to me too! We doubled the recipe but read back through and it looks like we did everything right. Chilled for almost 6 hours but won’t hold together. We are trying a couple pressed into a muffin tin as a last resort. I’m having the same problem! My dough will barely stick together! Saw gently, sharp serrated knife. Let the log warm a bit if it makes it easier. Me too! It’s crumbly and completely falls apart. I’ve just smashed mine into cookie-like shapes and am hoping they come out ok. I followed the directions and even weighed all the ingredients. Deb! I’m struggling. I double and triple-checked to guarantee that I didn’t misread a unit or an amount, but I followed to a tee and the resulting dough was just… an absolute mess. Crumbly is not the word. It looked absolutely nothing like the photo. I couldn’t form a log out of it if I tried. Boyfriend and I juggled ideas, and I ended up beating the egg and re-mixing to the best of my ability. It seemed to do the trick. The dough that remained after two logs found a few splashes of milk and a spoon. It’ll chill overnight before we attempt to slice it tomorrow for a NYE party. I’m hoping for the best but expecting the worst. I really, really wanted these to work perfectly, I’m upset that I had to modify it. I’m having the same problem! I mixed the dough last night and prayed that the fridge would fix the crumbly dough, but it didn’t. I’m going to try the troubleshooting you suggested this morning in the hopes that they can be saved for my NYE party. It’s definitely going to look crumbly at first — you can see my heap of scraps — but if the butter was fully beaten in and got fluffy, it should all come together. Stella Parks just posted about how wintry cold ingredients (butter, sugar, and flour) can cause problems for various baking projects. http://www.seriouseats.com/2018/01/how-to-troubleshoot-winter-baking-projects.html. Maybe try warming/heating your ingredients up to around 70 F? This seems to be a VERY common problem. Alison posted about it to saying that in a lot of cases it’s because a hand held mixer was used instead of a standard mixer. I used a standard mixer, followed the recipe to a T, still had this problem. As did my friend who has made them twice. For others, Alison recommends using a softer butter (Deb recommends cold) and whipping butter even longer. I haven’t tried it yet, unsure if I will. For cookies that are supposed to be this amazing and delicious they are turning out to be very frustrating! I used room temperature butter (1 block of European-style butter plus 2 Tbsp of regular butter) and had no problems with crumbly dough. The logs were easy to shape. I froze them initially, but they were too hard to slice from frozen. After allowing the logs to warm up a bit on the counter, they sliced easily with only occasional crumbs that could easily be squeezed back into the cookie. Hope this helps. Don’t give up on this recipe! They are truly truly delicious. Hi Deb, Should the butter be room temp in order to cream it? Or cold butter will cream? In a stand mixer or with a hand mixer, cold is fine. You’re just going to beat it until smooth/fluffy. Same issue here! I just tried to slice them to bake, and ended up kind of patching just about every one of them together, therefore losing the pretty circular look AND the sugar-coated outside. I set a timer for 3 and then an additional 2 min. (for a total of 5) to make sure the sugars and butter were creamy and fluffy, I smooshed and rolled, one log was in the freezer for 30 min. (I baked that one last night), one log overnight (which I just sliced and baked 15 min. ago) in the fridge and both were a mess upon slicing. All of them are a patched mess and I’m a little sad about it, and frustrated at how they look. They taste wonderful, but what a disaster to look at. I was also looking at a sad mess of crumbles and tears then decided to add a splash of cold milk and it worked out. When I initially made these a year or so ago mine were also a total smushy crumbly disaster. Went for a second go today and like some miracle, they came together with basically no effort. I bought fancier butter but while they’ll taste better I don’t think that likely was what made it better. BUT this time I weighed my flour instead of measuring. And for me 295g came in somewhere between 1 3/4 and 2 cups so I think I just had WAY too much flour last time. Not sure if you were measuring or weighing but it made all the difference! My did not hold shape at all. Spread and all connected. Followed recipe exactly. Chilled overnight. Any ideas? I’m having the same problem! No idea why this would happen. There are only a few reasons that cookies spread, most are too much butter or too little flour. You didn’t perhaps put the egg *in* the dough, did you? No I didn’t. I measured everything. I used measuring cup for flour not weight. Although both the cup and weight measurements should be the same, but cup measuring is always more variable. I estimate 130 grams per cup but one that’s been less fluffed-and-scooped or fluffed-and-spooned could end up with much more. That said, I tested this both ways, but I do fluff-then-spoon/scoop. FWIW I baked up one roll after a 30-minute freeze. They were baking up fine, but spread like crazy after I opened the oven door to check on them around the 8-minute mark. I baked up the second roll just now (never too early!) and this time kept the oven door closed. The second roll had the benefit of ~12 hours in the fridge, but I really think the closed oven helped. I had the same problem – they spread and lost their shape (though were still edible!). I weighed the ingredients and used 295g of flour and think that too little flour is the problem – Alison Roman was on the Bon Appetit Facebook page making these last week and she translates 1 cup of flour to 145g which would add 30g to the recipe overall! I have to say that the use of cups is increasingly baffling to me (as a Englishman…). It is so imprecise and in baking can only ever cause problems. Plus I think it is much more faff to measure flour in cups than to weigh it. I had the same issue with spreading. I followed the recipe exactly, weighed everything, used high quality butter (Kate’s). I chilled for at least three hours and it was very firm when I cut and put it in the oven (which I didn’t open!). They came out a greasy, spread-y mess. They were okay, but not great, and I was pretty disappointed! I often find chocolate chip cookies to be a little too sweet so I was excited about one that used less sugar. We didn’t even finish them, ended up composting the last few after our party, which has never ever happened in my life before. Any thoughts?? I also had my cookies crumble. I tried to let the dough warm up, but I still had trouble. Any other ideas? So, I’ve had this issue the first time I made the cookies, and since then a few folks wrote to me directly about the spreading. First of all, you need to make sure you’re using enough flour – Alison uses the scoop/sweep method and her cup weighs 140-145 g, not traditional 125 g. Also, spreading is probably due to overcreaming the butter, so try it again, don’t cream as hard, and make sure the dough BARELY comes together – should look more broken and short-bready than cookie dough, really. It’s interesting because she has shown in a few demos that she really beats the butter for several minutes until it’s very fluffy, like a cake, far more than I do when I make them. I do suspect that it’s her heavier cups of flour, however, that’s causing the spreading. However, I am getting just as many comments about the dough not coming together at all, so am resistant to urging more packed cups, as it will not help those people. Mine also spread all over the sheet. Maybe it was because it was in a convection oven? I made these sometime this year, but we didn’t like them nearly as much as your salted chocolate chunk cookie recipe. We had breakfast for dinner with friends last night, and I made your leek, ham, and gruyere egg bake which was delicious. I also made your perfect blueberry muffins, and our family loved them. My very picky husband thinks they are absolutely wonderful. We had them toasted this morning and he said he needed orange juice with his second one because orange juice is so good with blueberry muffins. I said that I could make them with orange zest next time, and he seemed to think I was crazy to consider even changing that little thing. Perfection! Thank you! Even after refrigerating overnight my dough was too crumbly to slice. After researching, it might be that I used European butter? One websource suggested that the lower water content in the European butter was the issue. I pressed it into a pan and am crossing my fingers! I used European butter. I’d say that on both this recipe and the Dorie Greenspan World Peace Cookie recipe in the archives, the single most frequent complain is about the dough crumbling as you slice it. It’s because the cookies *are* crumbly and running into chocolate chunks as you slice makes it even tricker. But I do it just the way I describe: saw gently, squeezing the cookie to keep it from breaking if needed. If the cookie does break as the slice falls over, just squeeze it back into a disc and it should bake up fine. So, could you make this in a 9″ baking pan? Because I really want to. I’m making shortbread tomorrow to celebrate Hogmanay (a day late, my Scottish ancestors are rolling in their graves, but I really don’t do NYE up), and I was going to make plain shortbread. But chocolate shortbread? Heck yes. So just seeing if this would translate because I generally hate making cookies. I like to press shortbread into a pan and make it like brownies. How bad could it be??? The worst-case scenario is you have to crumble it up and put it on ice cream. I say go for it. I just pulled out my first tray of these and they are so delicious! The dough was really crumbly, but I did a lot of mushing it together with my hands (also partly because I forgot the vanilla and had to get it in there! ), and it was fine. I baked them for about 18 minutes. I also made them yesterday afternoon, so they were in the fridge overnight, which was key. I just finished these and they turned out beautifully! I used European butter and measured by weight. For the people having trouble with the dough not coming together, one detail from eater’s version of the recipe that might help is to cream the butter with the sugars 3-5 minutes until REALLY light and fluffy. My family always complains when I stray from the stand-by chocolate chip cookies that we love, but these were a huge hit. I think they were a bit crumblier than they should have been, and that is likely due to my tendency to approximate the flour – I think careful measurement is important here. I’ll be trying to perfect these soon! I just pulled these out of the oven and they look great. Lots of crumbles but I just pressed everything together both while making the logs and when slicing the cookies. I did mix the butter and sugars for a long time. Unfortunately I forgot to salt the cookies…so missing a crucial element…but I love the shortbread flavor with the chocolate chunks. Bringing them to NYE party next door. Thanks for sharing this recipe! I made these at the last minute today for a NYE party. I had all of the ingredients on hand and the recipe looked simple, yet unique. They ended up being the hit of the party with everyone asking me what was in them. This is a recipe that I will make again and again. So yummy and special. I made these today for tonight’s festivities and they were DELICIOUS. There crumbled a bit when I cut the log, but nothing serious enough that pressing it back together didn’t fix. I tend to bake off only a few at a time, so I didn’t do the egg wash/sugar coat, but it tastes amazing still. I tried to make these and ended up with a huge crumbly mess! I put them in the fridge overnight and when I tried to cut them all I was left with was crumbles. What happened?! I had the same issue and I think it’s because stand mixer > hand mixer for this recipe (I only have the latter). Alison posted an Instagram story the other day addressing this issue. If you use softer butter and/or mix the dough with your hands after adding the flour, that should help! i tried these yesterday/today, and my dough was crumbly/dry not crumbly/glossy like the picture before I rolled it. now i can’t slice a whole cookie without the dough crumbling for my life. i think i’m going to bake this round up a cookie ‘brittle’, but do you have any suggestions for what i should have done differently? if my second round of dough looks dry, should i add more butter? lessen the flour? thanks for any suggestions! nevermind- read the comments above (duh). will be trying again and working the butter longer! That is totally what I did. I added 2 tb of sour cream to get it to come together but they weren’t that good. I used 1/2 the amount of butter!! Whoops. I’ll try again another time. But I realized it before baking and dumped my mixture into another bowl, beat the additional butter until creamy and combined everything. If anyone is in similar shoes, it worked fine. Theses are the most amazing cookies with the butter, chocolate, and salt which the combo is delicious! I had no problems with crumbling and I creamed the store bought brand of butter very well. I did weigh all ingredients. And I used a very good serrated knife gently. These will be a staple in our home. Thank you for the great recipe. Absolutely delicious – couldn’t stop at 1!! Made a great hostess gift for a lovely New Year’s Eve party last night. I love everything about you and your site. I have bought both of your books and make many of your recipes. I had some trouble with the salted butter chocolate chunk shortbread cookies. They were so crumbly/dry that most of them didn’t stick together. I chilled them exactly 2 hours and followed the recipe with two exceptions. I used a hand mixer and used only 227 grams of Kerrygold salted butter. The butter came right out of the fridge. Should it have been more room temp? They taste delicious but look a little gnarly. I made these without using the egg. They came out great! Wish I had remembered! I was cooking with my 4 and 6 yr old, and they were making me nervous. Will definitely be making them again! I made the dough late at night and creamed the egg into the sugar!! (By mistake but didnt realise until I read the comments). I didn’t do the egg/sugar roll. But also, the dough wasn’t hard to roll into a log as it wasn’t crumbly. SO yummy though! And I think easier to rol/cut because of the accidental addition of an egg. These turned out FANTASTIC! The recipe lived up to the hype for me. I did not have any issues with crumbling like other reviewers mentioned. One or two crumbled ever so slightly if I hit a particularly big piece of chocolate when cutting, but overall I found the dough very easy to work with. I chilled it overnight, and I was very gentle with my serrated knife when cutting each slice. Thanks for sharing this recipe. Now I want Alison’s book! I also made these and had the resulting crumbly mess. I used name brand, non-Euro butter. I was careful to scoop and level the flour (our scale is terrible and never works for me). And was most attentive to the directions because it was for a gathering. In the end, I just formed balls and flattened them on the cookie sheet, then formed the edges. I sprinkled sugar and salt on top. They taste very good still, but was disappointed overall. I could not even hold the dough together as I cut – after chilling four hours. It started falling apart when I moved the log to the cutting board. Skipped the whole brush with egg/roll in sugar step because I was feeling lazy and these were still awesome. My dough was slightly crumbly but rolled into a log quite nicely…. but my butter was also closer to room temp than cold as I’d pulled it out of the freezer to thaw on the counter and forgot about it for 5 hours. Happy new year! Hope your tour’s going well. There’s a typo in “it’s deeper flavor”. How is this different from the regular chocolate chip cookie? I’m waiting on my dough to chill right now, but I can tell from the recipe that this differs greatly from the average chocolate chip cookie in 2 distinct ways: firstly, that the dough is a shortbread, so the texture is buttery and crumbly, rather than chewy and leavened like a typical chocolate chip cookie; secondly, that the edges are eggwashed and sugared, with salt on top as well, creating a better textural variance and a strong sense of sweet/salty. I made these two days ago with 2 sticks of Finlandia butter, didn’t add the little extra. Used a combo of Bakers bittersweet chocolate and a pricey brand. Refrigerated overnight and had no trouble with crumbling. They are so good. If I didn’t put most of them in my freezer, they’d be gone. Right now I’m enjoying a maple nutmeg cookie. If I wanted to make a vegan version with earth balance for the butter, what would I do about the egg on the outside? Is there a substitute, or could I just skip it (maybe just roll the log in sugar and press in the sugar as best as I can)? I skipped the egg by accident and it worked just fine! Did you end up making these with Earth Balance? I’m thinking about trying it and would love to hear how it worked! These are delicious! My husband and I both think that they’re better than regular chocolate chip cookies (crazy, right?). I usually prefer the dough to the baked cookie and this is the first time that I can say that the cookie was just as good. These look amazing! I love shortbread cookies. I can’t wait to go off my diet and make these. These are delicious cookies. Thank you for the recipe. But, I have a question. Why am I exploding chocolate shards all over the kitchen, cutting the chocolate into chunks, when I could just go buy a bag of dark chocolate chocolate chips? When I see a recipe that says “chopped chocolate”, I often move on. 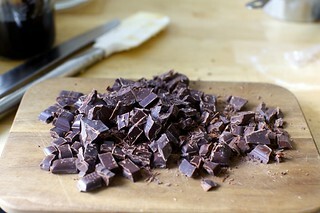 I love to cook and bake but chopping chocolate is a messy, thankless, (and for me, dangerous) chore. What is wrong with chips? I used chocolate chips when I made these today because I didn’t have any chocolate bars in the house. The cookies were challenging to cut and the chocolate chips didn’t get delicious and melty but they were still delicious. If you don’t mind your chocolate being a bit solid, chips are fine. Try using a serrated knife, and try shaving shards off the end of the chocolate chunk or bar rather then randomly chopping, to keep the flying chocolate to a minimum. I too tried to cut the chocolate into chunks and made a huge mess, shards everywhere and wish I had just used chips. If you’re using a bar of chocolate, try smashing it against your countertop BEFORE opening it. You get nice, non-uniform shards with some smaller bits. Deb, Question for you (or anyone else who has tried this): I’m planning to make these tonight and bake for tomorrow’s impending snowdoom. Could you make the dough, slice, and THEN chill to avoid the crumbling? I feel like I’ve seen Dorie suggest this somewhere for one of her cookie recipes so I’m curious if the dough needs to be in a mass for the flavor to develop or if that will still happen if chilled in cookie-size portions. Hi Deb, I am the fan in Berkeley who told you that I chose your book signing over David Lebovitz’s. I thought you might find the trivia regarding the book sales at Omnivore bookstore in SF interesting. Yes, you beat out David in sales. It was such a treat meeting you. Best, Janet p.s. the cookies came out great. Hi Deb – I’ve just sliced the logs after one night in the fridge and I’m feeling such despair (of the baking variety) because they’re so very crumbly and not really holding together. Out of the oven now still a bit of a crumbly mess but they’re yummy like a shortbread. I think I’d prefer semi-sweet but that’s because they crumbled and I couldn’t roll in the crunchy sugar so I’m craving a bit more sweet. Why are they so crumbly? Thanks for coming to Minneapolis!!!! I made these for the first time and although they were delicious, I too ran into the crumbly dough problem when I cut cookies from the first of 2 dough logs. When I used the second log (same batch of dough) I decided to take it out of the refrigerator and let it sit out for about 20 minutes before slicing. Dough was still firm, but absolutely no crumbling and incidentally much less spreading than the first batch. Hope this helps someone! Mixed these a few days ago and baked off a log last night. They looked just like the picture and the flavor and texture are unbeatable. I’ll be making these again and again. Thanks for publishing the recipe – I have Roman’s cookbook and didn’t give these cookies much thought on my first pass. I made these and used organic unsalted butter + the 3/4 tsp salt recommendation because that is what I had on hand. In Chicago, it is way too cold to be running out to the store just for butter..and they were delicious! Agree that chilling the dough makes all the difference. I have made the world peace cookies a few times and found this dough more forgiving and cohesive by comparison, but love both recipes. The turbinado sugar rim gives these cookies character and I am appreciative for another winning recipe! Can’t wait to try them again with the euro butter as recommended. Thanks Deb! I should not I also froze the cut cookies for about 10 minute before baking – that might help with anyone experiencing some spread. Those sugared edges are a brilliant idea! Can’t wait to try these (once this blasted Sugar-Free January project is over …). This looks amazing, and I have many plans to try it soon. I’m mildly confused by the instruction for the butter to be cold. If it starts cold, how is it supposed to get fluffy quickly? I’m wondering this, too! In the original recipe, I don’t see the specification to start with cold butter. I low-balled the flour by ~20g because I was worried about the crumble factor and because at altitude things always seem drier. My dough came together beautifully, but then spread quite a bit in the oven. They still taste good though. Next time I’ll just follow the recipe!!! I think the key to not getting crumbly dough is to beat the butter sugar mixture long enough. That said, although mine sliced well, they did spread too much. I had chilled overnight so that was a surprise. Perhaps more flour next time? You probably over-beat your butter/sugar. That’s what I did the first time and a food writer/recipe tester friend of mine helped me troubleshoot. It should not be so light and fluffy. I actually recommend following her time recommendation of 3 minutes rather than her description (which is a problem in my mind). Gonna post my results of my blog soon, but there are a fair number of issues with the recipe, including the flour measurement. See the NYT article that lists correct weights. The more perfect the dough feels when you’re mushing it together into a log, the less shortbread-y and more spread-y they’ll be. When spread, don’t really taste good. Did you post your results in blog yet? Want to make these cookies but so many negative comments. Hi Sandy – no, I’m delinquent on that post. For some reason, it’s taken me a long time to write. But it’s in the works and I’ll get it up as soon as possible! In the interim, please feel free to comment or email with questions if you have any. A blog post that helped me a lot is Olga’s: http://www.olgamassov.com/2018/01/alison-romans-salted-butter-chocolate-chunk-cookies/ – my approach was slightly different, but not much. Are these cookies super crunchy all the way through or do they keep some softness upon cooling? I do not have a paddle mixer … should I quit before trying, or should I still go for it (and how else can I make this)? I am dying it looks so yummy!! I used my hand mixer with great results. I just don’t have the space for a stand mixer. Thank you!! I have the same space issue and always “skip” when I see paddle mixer recipes but this just sounds too good to pass up! I don’t say this lightly. I agree it could be the cookie of the year. I did have a little bit of crumbling and spreading while baking after the 30 minute freeze. They looked pretty good though and tasted perfect. I found the raw sugar sprinkle to be a little unruly. Baking the rest of the log after a two day rest in the fridge. Very intrigued to see if I notice a difference. Deb these look AMAZING! Thank you so much for sharing this great, easy to make recipe! Baked these today after the dough had chilled overnight, and they were fabulous. I’ll bake the second log tomorrow. A couple thoughts: I used softened (on the counter) butter instead of cold because although it is so cold here butter is not softening much, these two+ sticks were a bit closer to the heating vent. ( I used boring old Costco stick butter) I did cream everything for a good long while until it wasn’t crumbly anymore. Had very few problems with it crumbling when sliced. Cutting them 1/2″ thick seemed a bit huge to me, so mine were closer to 1/4″ thick, and they turned out great. While the chocolate chunks were a nice look, the actual chopping of the chocolate was not fun and made a huge mess. Next time I’ll try them with the “good” dark chocolate chips just for easing the mess factor. Waiting for my son-in-law to eat one, but my daughter declared them a success and they are christening her new cookie jar. love the taste but the cookies spread out far too thin and therefore crumbled up into a zillion pieces…and I followed recipe to the letter! I had the same issue. Weighed everything and they baked up thin and spread out. So disappointing. I also had the “spreading everywhere” problem. Weighed everything, used Kerrygold. Logged up fine, sliced fine, spread into a thin, solid sheet. Maybe I’ll go back to garbage supermarket butter next time? I read all the “I MADE THIS!” reviews and was thinking of not making these. I was not in the mood to deal with a crumbly cookie dough. In Deb’s reply to Collee, she mentioned the World Peace Cookie. I’ve made those a couple times with great success so I decided to just go for it. I am SO happy I did. I used store brand salted butter, weighed all my ingredients (KAF flour, Dominos Light Brown Sugar), and used a 4 oz bittersweet Ghiradelli Bar and two 1 oz semisweet Scharffen-Berger bars (which I had no trouble chopping into chunks). I didn’t time how long I creamed the butter and sugar together. I just did it until it was “light and fluffy”. I had no issue forming logs. I refrigerated for 2.5 hours. I brushed with egg, rolled in turbinado sugar and sliced 1/2″ thick slices carefully with a serrated knife. I did not experience any crumbling. I had one or two chunks of chocolate pop out, I pressed them back in. I baked in a 350 oven (checked by oven thermometer) for 15 minutes. Keeping in mind that people said they spread a lot, I cooked the first log 6 at to a sheet – I had no issue with spreading. I cooked the second log (11 cookies) all on the same sheet. They are perfect. Thanks for sharing Alison’s recipe. I hadn’t heard of her book but my cousin just got it for Christmas! I followed the ideas of above commenters, particularly beating the butter and sugar for ~5 min until really light and fluffy. I also mixed a little past “just combined” when I added the flour. I wasn’t worried about too much gluten development because 1) not water in the recipe and 2) I used 1/2 whole wheat flour. They turned out great. I have one half of the dough left in the freezer and am looking forward to using it! for feedback on what I did incorrectly. Was your butter too warm? What kind of flour were you using? I made these again, and I highly recommend using Kate’s salted butter. I find it way too salty in general, but it’s perfect for these cookies. And I used butter instead of egg to coat the dough and it was just fine. This shortbread looks fantastic! I cannot wait to try it as soon as!! I made these for New Year’s Eve, along with the Violet Bakery caramel shard blondies (which, BTW, were INCREDIBLE). I wasn’t immediately wowed by the cookies, but that was possibly due to user error on my end (I don’t own a stand mixer so ended up using a food processor rather then softening the butter to use a hand mixer. Saw on Alison Roman’s Instagram stories today that she recommends softening the butter if you’re using a hand mixer and also mixing in the flour by hand). They crumbled a bit when I was cutting them but most were salvageable. I left my rolls in the freezer, one overnight and one for several days. I had super high expectations, both from your review here and also from watching the 100,000 instagram stories about them (haha) but maybe they’re just not my type of chocolate chip cookie. My husband was a fan so I will attempt them one more time, using the softened butter/ hand mixer approach, as I’m not going to be getting a stand mixer any time soon! The Fabrique Swedish bakeries in London make a similar shortbread cookie that includes dried apricot chunks along with the dark chocolate, and they’re rolled in pearl sugar. When we lived there, they were a to-go treat because, like you, if I had them nearby, I’d have kept eating them, much to the demise of my bottom half! This recipe sounds equally delicious, and I cannot wait to try it. Thank you for the post! These are amazing! I started with cold butter and creamed until fluffy and all butter was incorporated (maybe 2-4 min). I was too lazy to chop chocolate, so used chocolate chips. It mixed into big clumps, was easy to squeeze into a log. I refrigerated overnight, sliced and baked and had no crumbling or spreading issues!! They are so so good! A nice change from a standard American chocolate chip cookie. I did weigh everything, so maybe that contributed to my success? Used fancy (local-ish) American butter. This is the first time I’ve ever felt compelled to comment on a recipe here (and I’ve made many). These cookies were an absolute mess for me. Everything I sliced turned into crumbles. I’ve got the crumble heaps in the oven now, and they might taste delicious (the raw dough does) but they don’t look like “cookies” in any traditional sense of the world. I’ve no clue what I did wrong–I used a hand mixer, not a stand mixer, if that makes a difference. I forgot to note that I chilled these overnight in the fridge. I just made them with a hand mixer (a few hours ago), no problem. I ignored the directions and used warm temperate butter since I didn’t have a stand mixer. If your butter was cold, I think it could be a struggle to get it light and fluffy with a mixer…it’s easy with a stand mixer though. (It looks like other commenters have had the same problem you had when using a hand mixer and cold butter). I am definitely going to try this recipe! Those cookies look amazing! I did not need these in my life. I was blissfully unaware they existed until you posted it while I was on vacation in an ovenless apartment. They’ve taunted me ever since, so I made them today, my first day home. They were worth the wait, and are definitely worth all of the hype. These are OUTSTANDING. Made some to bring over to my folks’ place this weekend and they were a big hit with everyone! The crunchy/salty combo won over even diehard choc-chip fans like me. I’m sad /glad I didn’t leave any at home, maybe I’ll have to freeze a couple of unbaked logs for whenever company comes? Just made these. Creamed the butter and sugar very long and had no issues with crumbliness. I did put them straight into the freezer and sliced them when semi-frozen. They are delicious. Before making these, I read most of the comments. I bought high quality butter but just 8 ounces, so the balance was from Whole Foods. My dough didn’t crumble. Maybe because of the butter or because I used the Kitchen Aid and let the butter and sugar mix for at least five minutes. These are high calorie cookies. Since the weather is very cold, it seems like a good day to try them. I wasn’t disappointed. I made these and, for some reason, the dough would not come together at all. I froze half of it, and that did not stay together either. Very strange. I will try making them again to see what I did wrong the first time. Deb’s Salted Chocolate Chunk Cookie recipe is still my fav, so…no worries. There will be cookies. SO good! I made the dough last night, made sure to really cream the butter & sugar together, and used my favorite bittersweet chocolate bar chopped up into relatively large chunks. Let the dough rest overnight and then today rolled it in the sugar, sans egg so made sure to really press the dough roll into the sugar. My oven tends to run a bit cool & I typically run the oven 50 degrees higher than recipes state, so I baked one roll sliced up at 400 for 13 minutes but the ones on the edges overbaked so I’ll try the next roll (currently in the freezer) at th 350 in this recipe. Sprinkled them with a bit of maldon before they went in and they are truly scrumptious. I was going to bring them into work tomorrow, but…….. I followed the recipe, used normal/inexpensive butter, refrigerated overnight and they worked well. No spreading, very tasty. I did bake them about 17 minutes to make sure they wouldn’t be soft. So far…so good! My dough logs are in the fridge. I used a block of Irish butter but only after reading other comments here before starting did I realize that the Irish butter is slightly smaller than other European butters and so I’d actually made SK’s thick chewy oatmeal cookies last week with not enough butter (they were still completely awesome though). Anyway – after realizing my prior error, today I used the block of Irish butter and a few additional tablesooons of salted TJ’s butter, used my stand mixer with paddle attachment and set a timer for 5 minutes to cream it together. To avoid butter being tossed across the room I draped a tea towel over it. I scraped down the sides a few times but otherwise just let it roll. It came together beautifully. My dough was a bit crumbly when forming into logs but it smooshed right back together no problem. Here’s hoping it continues to go well! They are in the oven. The logs got quite hard in the fridge for 3 hours. I used my sharpest (yet small) serrated knife to cut into discs and while I did have to saw through a couple of chocolate chunks and the end bits fell apart, I just squished them back together or ate the bits of raw dough that fell off. Fingers are crossed! (Ps I used cold from the fridge butter as Deb recommended and diced it with a knife before putting in the bowl). They took longer – several rounds of setting the timer for 1 or 2 minutes then checking – to appear that ideal under-baked looking but actually-baked way, so here’s hoping I haven’t actually over-baked them! Cooling now. Minimal spread. Just have to add I love this thread! Separately, am very curious as to why some struggled with crumbliness while others among us did not. Feel an urge to experiment with the recipe this weekend to figure out why. Susan, I did not have issues with crumbling or spreading but I am also very curious as to why others struggled. JP notes they “scraped down the sides a few times…” when creaming the butter and sugars. I did too. Probably three times. And I don’t just scrape the bowl, I scrape off the paddle too. I did not time how long I mixed but just kept going until it was really light and fluffy. I’m wondering if the people that had success scraped the bowl? Normally, if I was successful with I recipe I move on but I’m really curious to see how this turns out for others. I wonder if the difference is in the flour content. I always use a scale. I wonder if people with too crumbly dough used cup measures and ended up using too much flour. Just a thought. It definitely could be but I have made these both ways. I think the cookie *does* veer crumbly; most shortbread too. Alison Roman addressed this on IG recently and said she thinks that people having more trouble with crumbly doughs might be using a hand-mixer instead of a stand mixer which might need more work/beating to soften the cold butter. I’m more likely to think it’s flour measuring — a scooped cup of flour is notably heavier than a fluffed-then-scooped or a fluffed-and-spooned cup. Regardless, press the crumbly bits into a disc shape and get it in the oven; they’re going to bake up deliciously. After reading about so many people having crumbling issues, I used the entire amount of butter to have the extra moisture (Plugra, 2-1/4 sticks) and they turned out exactly like the pictures and are delicious! The butter also sat out until it reached room temp (70F down here today) and I used a stand mixer to beat it until it was almost the texture of buttercream. There were mini-chips left in the cupboard after Christmas baking, and using those in lieu of the chunks made these super-easy to slice. Hope my experience can help others, because these were so, so good. This recipe is a disaster. I tried it yesterday and it was a complete failure, and I tried it again today – weighing all ingredients, beating the butter more, and switching flours – and it was still too crumbly to even form cookies after several hours in the fridge. I don’t understand what went wrong (twice!) but it’s the biggest baking disaster I’ve had. Otherwise have had lots of success with Smitten Kitchen recipes. Ok so I just tried to make this and the whole thing turned out in a crumbly mess. Anyone else have this issue and thoughts on what went wrong? I followed recipe exactly (which I never do) and the dough just wouldn’t come together. I tried making this tonight because they look amazing. But the whole thing turned into a crumbly mess. Wouldn’t roll or come together. I followed recipe exactly. Any suggestions and help would be much appreciated! Me too! I used KerryGold salted butter. This is my first SK fail, ever. It was a crumbly, messy, dry pile of dough. I baked six, cobbled together as best I could. No good. Pale, baked crumbs of… what? And with Valrhona chocolate! Trying to save the dough, I added a couple eggs and baked nine of that version; those tasted like a scone. Not horrible, but not worth the effort. My Mister will eat almost anything I consider a “fail”. Even he wouldn’t touch them. It’s weird that so many of us had trouble and just as many had success. UGH. So I took these out to bake this morning and as soon as I cut in, they crumbled. So I have no cookies, but chocolate chip crumbles baking in the oven. I haven’t done anything with the second roll because I don’t want more crumbles, unless these turn out magnificently. I’m wondering if less chocolate is better? I made these yesterday and just polished off a few with my lunch. I used store brand butter and creamed it for longer than I typically do based on others’ comments. I really worked the dough into a solid log before placing it in the refrigerator. Sliced and baked off without a problem. I wish I had packed a few more! I do not see where it says to add the egg it calls for? The egg does NOT go in the dough. It is used as an egg wash ON the dough logs prior to rolling in sugar. These look very similar to our very favorite cookies in the world, your salted chunky chocolate cookies. MMMMM….. I do not normally write comments, but I felt compelled to add onto the ones about this recipe. I had terrible crumbling issues. I creamed the butter and sugar for a long period of time (it was definitely fluffy!) and used a serrated knife. I am by no means a novice baker. I was so frustrated making these cookies that I will not be re-attempting them. I have been warning my food-loving friends who have also been eyeing this recipe that is not worth the hassle or heartbreak. Be warned! I used two sticks of Finlandia butter , didn’t add the extra, followed directions exactly, and my cookies came out perfectly. I had no crumbling issues at all. Help! I made this dough last night and it was so crumbly it was hard to form into a log. I managed a log-ish. This morning I opened the parchment paper and the log is crumbly and not staying together. Any ideas on how I can save my dough? And what the heck did I do wrong? Thanks!! Thanks for sharing this awesome recipe! I don’t usually post comments, but I made these last night and loved how they turned out! I wanted to comment because I had read through a lot of the comments who said the dough was too crumbly to work with. 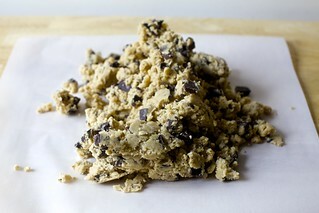 When I was done mixing my dough, I thought I was going to have trouble with the crumbly-ness, so I kneaded it briefly by hand after mixing in the chocolate chunks, and that really helped to keep the dough together more. After chilling for 30 minutes in the freezer and then another hour in the fridge, they even sliced like a dream without falling apart! Okay, these are delicious!!!! Beware that if you chill the dough overnight, the rolls will take awhile to get soft enough to slice and the slicing can get tricky due to the crumbly dough and chunks of chocolate but SO worth the level of difficulty. I’ll definitely make again!!! They were a huge hit with everyone. I have some President French butter in my fridge from my sons French class that didn’t get used. I’d love to use it here but it’s only 7 oz and is unsalted. Should I make up the difference with salted butter and add the 3/4 teaspoon of kosher salt as well? I made these last night, took them to work, and they were gone before lunch! I didn’t have bar chocolate so I used chips. I wish I had chopped them. I think leaving them whole made some of my slices off the log break and crumble. They all still taste the same, but it was disappointing to have the log split when slicing. The raw sugar gives a great crunch. Best.Cookies.Ever. Baked off the first roll and the family finished them off in under an hour. Wised up with the second log and hid the baked cookies up in my room. Seriously, these cookies are amazing! Only thing I did different was I sliced the cookies first, then did a quick “roll” into the egg wash and then in the sugar. A thought: I’m now on my third (!) (this is unprecedented in my world) batch of these and on the last batch, I was 1/4 ounce short of chocolate and no, this would no do so I grabbed some (fancy! from a good, or at least better, brand!) gelt and chopped it too and I can’t say for sure that it’s the blobs of gelt, but there are a few cookies where the chocolate seems to have liquefied, flattening the cookie a bit more. Does that sound at all like what you’re seeing? If you are not planning on rolling the cookie log in sugar before baking, do you still need the egg wash? I omitted the sugar and therefore omitted the egg wash as well. Turned out perfectly. I’ve made these twice now just as written with no issues. I make a lot of shortbread, so I am used to having to mold a crumbly dough together. I actually throw the whole thing together in my food processor. Probably won’t be long before I make them for a third time! My husband will eat 6 at a go and friends are requesting cookie deliveries! So I don’t have a stand mixer, and seeing people’s comments, will I be OK with a hand mixer as long as I am diligent about getting the butter/sugar mixture super fluffy? I mixed them in my food processor. It did a great job with the butter being so cold. I also think kneading the dough once it is all mixed is a good idea. I’ve made this 4-5 times by now and it’s come out perfectly each time– no crumbling whatsoever, and no spreading when the cookies bake. This recipe works. You just need to (a) thoroughly cream butter and sugar till super light and fluffy (about 5 minutes– I don’t see why you couldn’t do this with a hand-mixer, but you might just need to give it more time), taking care that though the butter is quite creamed it does not get too warm; (b) adequately fluff your flour before measuring; (c) thoroughly chill the dough logs; (d) slice and bake while dough is still cold, using a serated knife, and bake on a not-warm baking sheet. The details matter. Is it ludicrous to try these with a gluten free flour blend (Cup4Cup)? These are so awesome! I would love to be the kind of the person that always has a “roll” of them in the fridge just waiting to be baked. We skipped the egg/sugar on the second batch and they were still perfection! Thanks for another great recipe. These look Ah-maze-ing. my mouth is truly watering and I plan to make them. I am also leaving a comment because much to my own dismay I will no longer receive your emailed updates. And also sadly there wasn’t an appropriate “reason code” to capture my reason. WHAT, you may ask, is the reason? I’ll tell you why. I understand why people have advertising on their pages, it’s a fact of life now – everybody’s got to make a living….. but on your emails TOO? That’s too much for me. I already get WAY too much email, and to have content cluttered with advertising… the image AS BIG as the content photo and FIRST …. I don’t to look at toothbrushes when I open my Smitten Kitchen email. I really used to look forward to receiving the beautiful delicious dishes that appear in your blog – NOW, I’ll have to settle for checking the website from time to time when I have a chance…. sure the ads will be there…. they are everywhere… but NOT in my email. thank you… now, i’m off to make these scrumptious looking cookies. I put half of the very crumbly dough into a large ziplock bag, shook it a bit to even it out and then it very easily went into a log……..just a suggestion, will keep the bags for future logs in the baking drawer! Now to bake them. Oh man, what a mess! Think I followed the recipe exactly, but I still ended up with cookie crumble. I was able to form the dough into logs with some difficulty, but when I tried to cut them (after a day in the fridge) they just totally crumbled. Maybe a handful of slices remained intact. I’m still baking it all – short bread deconstructed! Will have to try again another time. I tried making this today and the end product was way to crumbly, and was not able to form a log. The brown sugar was not the freshest, could have had something to do with it? No issues with crumbling, cutting or spreading. The recipe turned out wonderfully. This will be my new go-to for chocolate chip cookies. One thing I’d add: salt. I think adding a pinch of salt in the dough (in addition to the tops) would bring more complexity. The amount of salt in salted butters varies, but usually it’s ~3/4 tsp. per stick, which should be plenty salty. Perhaps you have a particularly un-salty brand of salted butter? Ah, looking for this flour information on line and just realized that it is a book, “BrarveTart”. I am a very loyal King Arthur consumer (personal and several bakeries). And I only use their flour for bread. But, I am going to experiment with the Gold Medal. Thanks! …and will give me another excuse to make these for a third time. BTW, re: crumbling, I use a scale and the recipe is perfect. Appropriately – for shortbread – loose, crumbly, but holds together to work with. These are BAD, BAD cookies ! Sugar frico!?! (it’s a thing, right?) Dark chocolate in a tender & delicious crumb with just enough salt that begs you to take another bite. My only solution is to make them 1 1/2″ diameter, then 2 cookies it is, ’cause one is not enough. I may have inadvertently upped the ante on these beauties. In searching through my cupboard in my remote mountain home, I was dismayed to see a complete lack of semisweet baking bars stored there. Upon searching further, I found a foil wrapped scrap or two of baking bars and some hershey’s Bars leftover from s’mores gone by. While chopping these bars, I discovered the dark chocolate bar to be filled with caramel. Why I have uneaten dark chocolate – caramel combos lying around, don’t ask… Regardless, these cookies are amazing and I would HIGHLY recommend using a caramel filled dark chocolate bar in place of the semi sweet chocolate bar. The surprise little bits of caramel made these even more delictable. Thanks for the recipe, Deb! I just made these- and had no problems with the dough. It came together beautifully. I was a little nervous after all the comments, but Deb’s recipes have never failed me, so I decided to try anyway. I used half chocolate chunks and half regular chocolate chips, because that’s what I had. The cookies are delicious! I was apprehensive after reading a bunch of the comments, but……. success! Here are some of the things I did that may have led to it?:. 1) I accidentally used softened and not cold butter….but, since I’m in the middle of a really cold Chicago winter, it still wasn’t completely soft even after being out of the fridge for 6 hours! I used regular store-brand butter and a hand-mixer when creaming with the sugars. 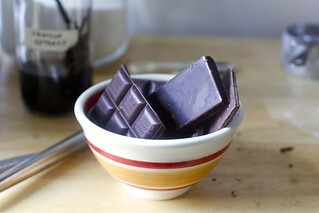 2) I didn’t have a chocolate bar, so I just rough-chopped some dark chocolate chips. In the final product, you can’t even tell they used to be chips– they look like chunks. 3)After reading about all the crumbling issues, I thought that having a really sharp knife would be key. But…our serrated knives aren’t especially sharp, so I tried our sharp paring knife and it worked perfectly! I used a slow, sawing motion when cutting. 4) I also noticed that when I was about halfway through cutting the log, the cutting got much easier– basically NO crumbling at all, and a super-smooth cut. It probably depends on how cold your fridge is, but my dough seemed to work best after a few minutes to warm up from the fridge. 5) I thought it would be messy and tough to cut the log after coating it in sugar…..so I actually did that part after cutting the log into rounds. This helped me to really get a good grip on the log while cutting, and also have really beautifully rimmed cookies. I just put the egg in a small bowl and took each cookie and rotated it in the egg, just coating the rim, before spinning the edge in sugar. It took a little more time, but not too bad (if you took the time to remove all the chickpea hulls for the ethereally smooth hummus recipe, this was a snap!). Anyway, hope these comments helps someone! Good luck! Still tasted good, but I think I’ll stick with your salted chocolate chunk cookies in the future. Fool proof. Am I the only person that really doesn’t care for these? They were just like. An o.k. cookie. But I would much rather have a normal chocolate chip or a normal short bread. Me too. So not as interesting as a chocolate chip cookie. Glad I tried though. Re: the crumbling cookie dough crisis. The instructions say a roll 2″ in diameter, cut into 1/2″ slices. Make sure that your roll is well-compacted, and measure your slices. Any less than 1/2″ thick, and the dough does not seem to have enough mass to keep its shape. The ratio of diameter to thickness of slice is as important as the compaction and moisture level of ingredients. Temperature less so, though chilling does help solidify fats, making slicing slightly easier. I didn’t chop the chocolate ahead of time because not necessary and just used Ghirardelli’s big dark chocolate chip. They incorporated smoothly, and the chopping took care of itself when I went in to slice the log into cookies! These turned out great! I subtracted 1-3 T of flour and increased the oven temperature about 15-20 degrees and decreased cooking time by 2-3 minutes to allow for 7,000+ altitude, and they turned out about perfectly! I had no crumbling issues and just stirred and pressed the dough together until all moist and incorporated into a smooth log. I made sure to cream the sugars and butter first for a few mins (first chopping up the butter to let it cool down to room temperature a bit). I froze the dough for a few days before testing the first batch. I let the log thaw about 40 minutes before the egg wash and sugar rolling. Then I sliced carefully with a very sharp knife before placing them on the Silpat to salt and bake. The Maldon salt flakes were a delightful touch! I made these rolling the logs in sparkling sugar. I have to say when I am not eating the cookies I am dreaming about eating the cookies. These may be the best ones ever. Thank you so much Deb for this posting. Your website recipes and books are absolutely BEYOND! Oh dear, it rarely happens, but I messed this recipe up so bad by not mixing the butter and sugars enough. My dough came out super crumbly. I had hope when I froze the logs overnight, as they did come together but fell apart when I started slicing them into cookies. I transformed the dough into bars in an 8×8 pan, but they were too crumbly. The chocolate was so good, though. It was tough getting defeated but, I am so obsessed with making these that I got the ingredients again…. I was nervous to make these after reading the comments, and fortunately had no trouble at all. 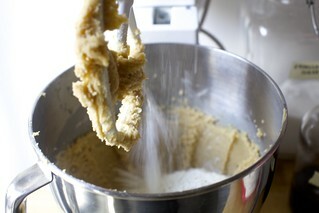 I think using the stand mixer, and making sure that the butter and sugar is very well blended is the trick. For what it’s worth I also used high quality butter and medium fluffed flour measurements. These cookies are delicious! A grown up chocolate chunk cookie. The 1st log I refrigerated and baked within 1 day. I had no problems with the dough coming together. But I failed to notice that the oven was at 325 until 6 minutes into the baking. I turned it up and baked the cookies a little longer than directed, and they spread a lot. I assumed it was because of the temperature issue. The other log I froze. With my sharpest knife, I did not have a problem with cutting the cookies. I baked them at the correct temperature, but they still spread. And I did use European butter for the dough. We loved the flavor of these, so I will try them again. I’m relieved that I’m not the only one who had issues with them spreading! After seeing pictures of this cookie non stop in Instagram for I gave up and finally joined the salted butter chocolate chip shortbread bandwagon, and I cannot look back. I made them using a hand mixer for beating the butter and sugar and then I mixed the flour and chocolate chunks by hand and had no issues. Yes the dough is a little crumbly but it came together as a log just fine and after chilling it for a bit I had no problems cutting the cookies. This was so easy and delicious it has officially joined the recipe rotation. These are excellent! Definitely chill for 2 hours, and just to be sure, I popped them in the freezer while the oven preheated. Used a large serrated bread knife to cut. I had a little bowl of sugar to make sure the slices were nicely coated after the cut. One little hack: Trader Joe’s semi-sweet choc chucks (no shards!!) sure are easy. Great instructions, Deb! These are delightful! Has anyone attempted these with chopped nuts? I was thinking pecans would go nicely, but I’m afraid to chance it with so many having issues with crumbly dough. I made mine with chopped pecans and walnuts. No issues with crumbliness as long as you beat the butter + sugar thoroughly. I made a huge error mixing these cookies, thinking a stick of butter was a cup, I had mixed the sugars and 1/2 c and 2 T of butter and had begun adding the flour when – omgosh – remembered and added the second stick. Using a mixer I thought the flour is going to be overmixed but proceeded and finished adding flour by hand. After being in frig overnight I found them very difficult to cut and most were patched together…also the cookies melted while baking. But man are these divine! Just wished they looked better. Next time will mix ALL the butter with the sugars before adding the flour. Also, used Scharffen Berger baking chunks and left them whole. They already resembled the chuncks in the photo. Next time will cut them in half so hopefully they will cut more easily. Did my cookies melt more because of how I goofed up mixing them do you think? Thanks for another great recipe! I made these with my daughter, who confessed all she really wanted was cookie dough, and I am sorry to report that was the best part. We were out in the sticks & salted butter is all we can buy so it seemed a perfect recipe… but not without a stand mixer! A handheld mixer got us nowhere so we creamed by hand FOREVER and needless to say it never got fluffy. We coaxed the crumbly mess into two logs (minus a lot of tastes, which were great! ), froze one and made the next 5 days later (the creaming really tired us out!). It cut fine but the cookies are just average: shortbread & chocolate; there is no interplay between the two flavors and none of the enticing brown sugar notes of an actual chocolate chip cookie or wonderful chewy to crispness dynamic. I mean it is a nice cookie, but let’s just say it is a week later and we haven’t eaten them all, a record around here. The dough is great though! No egg = no qualms about eating it raw at all! Mine spread a bit, but they were marvelous. I used a fennel flavored dark chocolate which was just perfect. This time I’m trying them with an overnight chill and Alter Eco’s salted brown butter dark chocolate. I made them today and got super nervous reading the comments section that my dough wouldn’t come together. So I used a trick up Mark Bittman’s shortbread sleeve and added an egg yolk and swapped out 1/2 cup of flour for cornstarch. The dough came together beautifully and the cookies have an incredible texture. I did find them a little too salty, so I may sub some of the butter for unsalted next time. I also found that if you cut these on the thicker end, you taste the chocolate more and they become crispy crunchy on the outside with a pocket of soft on the inside. Heaven!! Hey Deb, I want to bake off a few slices tonight and save the rest for tomorrow. Do I put on the egg + sugar on the whole thing, or should I just slice off what I want to bake, roll it in the egg and sugar, and keep the rest of the dough naked until its ready to bake? These are possibly the best cookies I’ve ever made, and I’ve made almost all the chocolate chip cookie recipes on Smitten Kitchen. My daughter keeps asking me when I’m going to make them again and we haven’t even finished the first batch. I used chocolate chips, because I’m lazy, and I had to freeze the dough unexpectedly but they still turned out great. I didn’t defrost the dough before slicing and used a sharp, heavy knife to get clean slices. I had no problems with the dough crumbling or the cookies breaking apart. I think they’d be good with other additions, too or even just plain! Don’t skip the sugar outside, it’s almost the best part. I love the idea of the sugar crust, but one of my guests is allergic to eggs. Whatelse can I paint on the logs that would allow sugar to adhere? The original video from Allison says to use cream if you’re allergic to egg. But some people here say you can skip the egg. My logs are in the freezer right now and I haven’t decided if I’m going to bother with the brushing/ rolling yet. I didn’t use anything on the logs….the batter is moist enough so that the sugar adheres no problem. My first batch is in the oven now! I have a double chocolate cookie recipe that slices like this one and sometimes I coat those logs in sugar too. I’m pretty sure I followed the directions exactly (I weighed the ingredients), but the dough was so crumbly it wouldn’t hold together. I ended up nuking the dough in the microwave for 45 seconds to get the butter to melt a little so that I could – sort of – mold the dough into logs. Then, when I tried slicing the dough, it crumbled to bits. I ended up piling little mounds of crumbs on the cookie sheet. The cookies look awful, but they taste divine. Did anyone else have this problem? I’m not a regular baker but SM is luring me in. I had to beat the butter mixture longer and at a high speed to get it a little fluffy. My Kitchen Aid is a little big I think. But the dough was fine albeit a little hard. Refrigerated overnight and cut with a sharp serrated knife with no problem. The trick I think is using a good tool. Came out exactly as pictured. My question however relates to the thickness of the cookie. Half inch seems a little thick. I had to bake my a little longer. I think I’ll try making it thinner next time. Anyone had an issue with this? Otherwise it’s yumm! I made these and while tasty, I couldn’t get the batter off of the hand mixer blades. It was thoroughly stuck. What do you think I did wrong? OK – do we need another comment on these cookies? Probably not. But. 1) I have made a lot of plain shortbread using the Joy of Cooking recipe. I don’t use rice flour. It always turns out wonderful as long as the butter is good. 2) I am ho hum about chocolate chip cookies. Chocolate is great, but not my favorite. 3) I had serious doubts even though the crumbly stuff did compress into nice rolls. I left the rolls in the fridge for 24 hours. I did the egg and sugar. Mine baked for about 16 min until I could see slightly brown edges and not just sugar frico. People (as Deb would say) these cookies are superb. I am totally impressed. Follow the recipe, really mix the sugar and butter, and do it now. I made these cookies and got them to hold their shape! I’m baking at 7,000 feet elevation so take this with a grain of salt, but I made a few adjustments and they were successful. I did beat the butter and sugar for a full 5 minutes in the kitchenaid. I lowered the total sugar amount by about 15 grams and increased the flour by about 10 grams. I chilled the logs for 6 hours and also lowered the baking temperature to 325. The sugar, flour, and temp adjustments help with baking at elevation, but I think probably also contributed to the dough holding together beautifully. I would probably spring for the fancy butter next time – the flavor is fine but not mind blowing, but I often have trouble with cookies melting and was pleasantly surprised that these didn’t given all the reviews! Ok, I’m not a huge shortbread fan but after all the hype I had to try these- because I am a HUGE chocolate chip cookie fan and I was intrigued. When I tried the first one about 30 minutes after they finished baking, I thought they were good, but maybe not worth the hype. But this morning when I had another…ohhhh boy. These are GOOD. I think they just needed a little time to firm up after baking. Notes: I used kerrygold butter and creamed it with the sugar using a hand mixer. I spent a solid 5-7 minutes on this step based on other reviews. Chilled the dough for about 3 hours and used a freshly sharpened non-serrated knife to slice the dough, and I had almost no issues with the dough falling apart. They have a strong shortbread quality but are also nice and chewy, like a good, traditional chocolate chip cookie. I’ll definitely make these again; the recipe is simple and quick, and it’s nice that it makes two logs…so you can always have one in the freezer for emergencies! I have made tons and tons of recipes from the site and the cookbook, and this was my first Smitten Kitchen disaster :( I followed the steps exactly, and ended up with a crumbly mess. I chilled one log in the fridge for 4 hours, and the other in the freezer for the same. I couldn’t salvage either one. This was so disappointing. I made these and they are absolutely deserving of all the hype and praise. I was a little bit scared after reading some of the reviews here, but I had to try them anyway. Deb has included all of the relevant tips and info from the recipe in the actual book (I consulted this page and the book). If you follow the measurements as outlined, you have nothing to be scared of. I set a time and let the mixer go for a full five minutes to get the sugars and butter super light and fluffy. Yes, the result is a bowl full of big crumbs, but pile them out onto the cling wrap and work them into a roll. If anything, know that you can smack this dough around a little. MAKE it be a log, and it will be a log. I froze one log for 30 mins and then baked – perfect with very little spreading. I did the other in the fridge and baked the next day – pretty much the same result. If something crumbles, just work it back into a disc and bake on. Really a great cookie. Delicious! So rich and tender. Used a food processor for all steps up until adding the chocolate, and had no problems with crumbliness or spreading. Inspired a vigorous family debate about shortbread vs. traditional chocolate chip cookies. But the shortbread lovers in the family loved them. My daughter had made these in early January when I happened to be visiting her and I truly believe they may be the best cookies I have ever eaten. I made a batch of the dough and transported it in a cooler to my son’s house (3 hours away) and baked them that evening. Served them at a family gathering the next day. Show stopper!!!!! Everyone was blown away by the taste and texture! Cookie of the year, indeed! I made these and they completely fell apart after 1 day of refrigeration. I think there needs to be a binding ingredient. I could barely cut them and basically had to reshape them into balls. I can’t describe….amazing? No, more than that…ummm…hard to stop eating…well, yes…but you did forewarn us all…ummmmm….irresistible? Well, definitely….ummmm…..ok, just make them and call it never going back to regular chocolate chip cookies ever again…..
You described them perfectly, Judi! Bravo! Holy cow amazing cookies! The egg/sugar on the edges makes for a chewy/crunchy finish. I didn’t have any trouble with crumbly dough. I recommend beating the butter/sugar until VERY creamy. And I used slightly less flour as I use 125 grams for my cup of flour weight. I also used 1/2 European salted butter and 1/2 TJ unsalted. Delicious! I giggled a bit when reading about the “crumbly mess” problem. My mother would make old fashioned Scottish shortbread every Christmas. These were pressed into a round pan, not individual cookies. BUT, the recipe called for working the crumbly dough until it came together in a ball, then you pressed it into the pan. The dough NEVER formed a ball for my mother. She just would dump it into the pan and press it out flat and it cooked/baked just fine. One year, my Aunt Marion offered to help in making a double batch. The two of them stood side by side. When it came to working the dough into a ball, it almost instantaneously formed a ball for my aunt. My mother just stared! Turns out my aunt has very hot hands and my mother’s were alway cold. The warmth was the missing ingredient. We laughed about that for years. So, the advice someone offered to just push it together when it crumbles sounds very familiar! Should work, though they may not look as pretty. And try using dental floss to cut the log (wrap a piece around the log and pull it crosswise at the top. They do it on other cooking shows all the time. Less friction – might help with the breaking apart when slicing. So, I made these the other night and everything worked perfectly. I left off the egg wash and sugar roll – mostly because I couldn’t be bothered. I did NOT have the crumbling issues other commenters have had and I wonder if it’s to do with the amount of butter. When I was at the grocery all the European butters I saw were only 225 g blocks so I supplemented with the unsalted I had at home, but I can see how that 30 extra grams of butter would help hold the cookie together better. I did have the odd bit break apart while slicing but nothing crumbly crumbly like what’s been described. As for taste – I think I hadn’t fully thought through short bread plus chocolate chips so I was expecting standard chocolate chip cookie, which is silly, because that’s exactly what they are – so so buttery (in a good way). I’m taking these to a party tonight so I’m hoping they’re a hit! These might be the best cookies I’ve ever had – which seems too hyperbolic to even type, and yet I think it’s true. And I’ve eaten a lot of cookies. My mom made the dough two days ago and left in my fridge; she used half white and half dark chocolate chunks and sucanat instead of usual brown sugar. I rolled it in coarse sugar with no egg wash (allergic son) and it stuck just fine after baking. These are phenomenal. They taste like brown butter but there is no brown butter in them! If you’re for some reason on the fence, I encourage you to get off and make these now! Wonderful cookies! I failed to attend to the weight for the butter and just used a 227g block but there were no ill effects as far as I could notice. I mixed the dough in the food processor before kneading in the chocolate chunks by hand. Slicing was a crumbly experience and some slices came out far more attractive than others but the advice to smush together the crumbled bits worked well. Deb, what cups to grams guideline do you use? Yours seems different than the one I use (1 cup equals 120 g) which made me wonder about the 295 g of flour recommendation in the ingredient list. Thanks! These worked out great! It was my first time making shortbread but it was easy & they turned out beautifully! Thanks for the recipe, it’s a keeper! This did not bake at all for me! It was okay to eat but it tasted like flour and butter. I double checked the amounts I used and it was all correct. My guess is that your cookies were underbaked. Shortbread needs to get really golden or it will taste how you described. Was about to make the fudgy brownie cookies and realized someone has been nibbling my chocolate. So…I thought I’d make these. But I only keep UN salted butter in the house & my hubby has high blood pressure. So…would they be as good with unsalted butter? Of can I add salt to the recipe? How much? Hi All. I have the recipe but Alison Roman that calls for 55 grams of lite brown sugar and 326 grams of flour. I thought the cookies were a bit dry. Not sure if because of more flour or over baking…. Why are the amounts different? Any ideas? The version I had in her book didn’t have weights (I thought? Am I losing it?) so I applied the ones I use (and used). I didn’t have the issues others mention in the comments (although I did completely forget to add the vanilla…whoops). I highly recommend baking by weight for these. My two sticks of standard American supermarket butter weighed only 226g – I needed a few extra tablespoons to meet 255g than I would have added had I not gone by weight. I let the butter soften for a few hours in my slightly chilly kitchen, and then really let the mixer have at it for awhile to get it very fluffy. I did have some crumbling on slicing but it was more like chunks breaking off that I could easily press back onto the slice. Hope this helps some people out since these are really good…even without the vanilla. What kind of chocolate did you use? I made all sorts of subs (whole grain flours only!) because of what I had on hand, and these were still easy and AMAZING. No crumbling, nothing challenging, pure alchemy of smell while they were baking (much more than the sum of their parts), and magic to taste! I did all measurements by weight, used all brown sugar (had no white sugar), half spelt flour and half whole wheat pastry flour (had no all-purpose and I prefer whole grain baking anyway), cut some bit and bobs and stubs of different dark chocolate bars I had into chunks and it was less than what was needed, used a 227g tub of European salted butter and used unsalted to make up the difference in weight. Still – magic! This is a genius recipe. I think slicing them with a sharp bread knife was key (it distributes the force of the cut evenly over the cross section of the roll) but other than that it was simple and perfect. Also, I don’t have a stand or a hand mixer – I creamed the butter and sugar and mixed the dough with my hands. It didn’t need to be fluffy because I couldn’t get it there! Texture was incredible! I was intrigued because for so many, this recipe failed .. for others, it was perfect. I used Valrhona bittersweet bars from TJ and TJ’s great cultured, salted butter from Brittany. The butter package was 250 g and I weighed out another 5 g for it. I use an oven thermometer and made sure it was at 350. I used Gold Metal flour, using fluff and spoon method but I also weighed what this came to: 276 g NOT 295 g. I think this might be why some people had trouble; I stuck to 276 g. I read the comments a few times and decided to take a flying leap and listen to Reshmaadwar .. I removed 1/2 cup of flour and replaced it with 1/2 cup of cornstarch and added 1 egg yolk at the end of creaming for at least 5 minutes. My butter was not cold from fridge. When I was forming the 2 logs, they were too soft to roll well so I put them in the freezer for an hour. Did not use the egg wash, just rolled in the turbinado sugar, log was semi-frozen when I used the serrated knife to slice, no real trouble slicing. No spreading. Baked for 16 minutes (it was hard to tell if the edges were getting golden because the sugared edges were brownish. Delicious! Success! Can you speak a bit more to the bake time & temperature? I tried following the instructions (350 F) and the cookies were nowhere need baked even after 15 minutes. I ended up having to give them 19 minutes and it made me wonder how much this affected the taste. You said in your post that a minute less of baking helped a lot, but they seemed super doughly and melty in the oven at 11 minutes in my oven. Did you use Convection Bake or Regular Bake? How many minutes did you bake for the second round of cookies (the ones that were better chilled)? I only have a non-convection oven. I think ovens vary and baking times vary the most with small things like buttery cookies. Some people are saying that 15 is under, other that it’s over. Thickness will affect baking time too. Most important is that they have a golden edge before you take them out. Made this last night. SUPER easy – I was ready to have difficulties but I didn’t! The dough was not crumbly, using a seraded knife made it easy to cut, I bought raw Domino cane sugar (couldn’t find demerara at the grocery store but I guess it’s the same thing) and that was great. My cookies needed less that 15 minutes to bake. My neighbors came over to try it and one of them kept popping them in her mouth. Bet they would be GREAT with coffee or espresso. Even my picky husband loved them! I forgot the vanilla extract! And the dough is now chilling in the fridge…am I doomed? It should be fine. It’s not a major player here. I made these today with 9 oz. Kerrygold butter and made up for the rest with 3 tbsp. unsalted butter I had in the fridge. The dough was definitely crumbly and difficult to mold into logs, but I got there eventually. The hard (and really frustrating) part came when it was time to slice the dough from the logs. Each slice totally fell apart into crumbles and I had to mash it into something that resembled a cookie. I chilled the dough for nearly 3 hours so I’m not really sure what to do differently in the future. All of that being said, they still turned out delicious (just not very pretty) and that’s with me forgetting to add the vanilla. These cookies were A TRIAL. With that being said, the ones that came out were delicious. However, there a bit more crumbling along the way than I normally have the patience for. I’ve just made these and they are as wonderful as Deb claims. I followed instructions to a T and they turned out perfectly and taste all the more delicious for me having a sugar free January (up to now). The only bit of advice I would add is to let them cool and solidify a bit between taking them out of the oven and transferring them to a cooling rack , say four minutes. I’m removing them from harm’s way tomorrow and taking them in for my co-workers in a charity book shop. 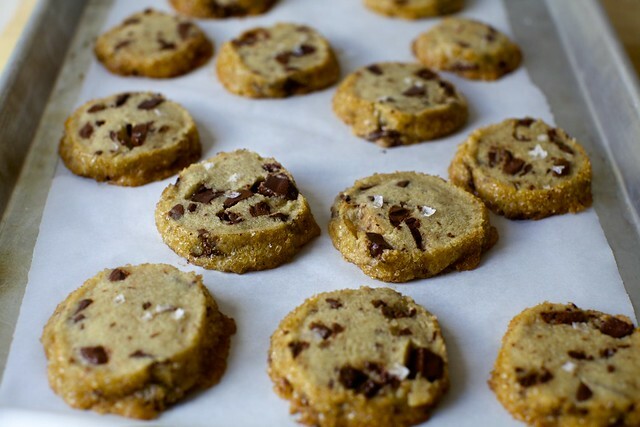 The NYTimes version has an interesting note: https://cooking.nytimes.com/recipes/1019152-salted-chocolate-chunk-shortbread-cookies. Apparently [other] Alison uses 145 g for a cup of a flour. They also suggest that the butter should be room temperature if you’re using a hand mixer. I saw that and was surprised her flour cups were so heavy! (Baking nerd alert.) She scoops, not fluffs and scoops. No right or wrong way, but if you’re having trouble with crumbling, I believe the heavier weight is not going to make things easier. It’s interesting because initially the NYT version didn’t have weights in it. I made a private note in my NYT cooking app that I had saved Deb’s version for the weights. It’s very frustrating to have a baking recipe without weights, especially one like this. These are simply the BEST! I have become very popular by bringing them to every gathering. Thank you, Deb! My all-time favoritec cookie is Scottish shortbread. Followed closely by chocolate chip. This combines both. It is AH-MAZING! Eating these now. They are delicious! I used a hand mixer and beat the butter/flour until it was super fluffy, they turned out perfect and stayed together when cut. These. Are. Fantastic. The dough can be crumbly, be sure to really beat the butter and sugar (probably at least 2 minutes). Weighing ingredients, especially the flour, really helps here. I prefer to cut them in at least 1/2 inch rounds as I find any thinner creates more of a crunchy shortbread (which may be your thing). I cannot get these to not be totally crumbly. How do you do it?! It’s almost impossible to slice a full cookie off the log. Wtf?? I’ve been on the fence about making these because it seems like nearly half of people had serious trouble with it but finally decided to give it a go. I followed the recipe exactly as written and used a scale to measure ingredients. I creamed the butter and sugars for 5 full minutes. Everything was crumbly when I moved it to the parchment paper, but it came together pretty quickly and easily into logs. Chilled for two hours, cut it with a serrated knife with basically no problems problems. They came out AMAZING. I didn’t expect them to live up to the hype but two of us ate almost half the cookies this afternoon…make these for company or with a plan to give them away because they are addictive. They are clearly shortbread, so it won’t replace my standard chocolate chip cookie recipe, but will be a nice alternative! how long did you cook them for? These are insanely good. Used sparkling sugar for the sides and European butter. The trick is measuring ingredients and then to mix well, and even if you are using a stand mixer, give the mix a hand mix at the end because bits of flour may be stuck at the bottom of the bowl, resulting in a crumblier second log. These spread a little more while baking than I expected so next time I might give them a chill after I slice them, and then bake them post chill. My husband and toddler are currently devouring these post bake! Melty chocolate faces! Thanks Deb! I made these cookies and they were the best. Everyone loved them. Really like your recipes. Going to make oranges this week with the yogurt. Great blog. I have made these a couple of times since I saw the recipe and my phone is still ringing with requests to share the recipe. It has really been a hit. I freeze them after baking (otherwise I would eat the whole batch) and every night I see my husband going into the freezer to get one. He doesn’t even wait till it defrosts! I see from previous posts that some people had trouble with the dough. I leave the butter out for a little while to become room temperature before beating it and I use a stand mixer and beat for a good 5 minutes. Have not had any problems. Has definitely become my go-to cookie to make! Has anyone done them with both the measurements here and the others ones posted in the NYT article, where the flour measurement is more? I’d be curious if the amount made any difference….! I just made the these with softened Irish butter, they were just amazing! These were delicious! I actually found it easier to cut with butcher knife then serrated knife. Argh – pea-size chunks? Kidney-bean size chunks? (Cherry tomato-size chunks?) Any guidance would be appreciated, as well as tips on not ending up with lots of fine shards regardless of chunk size? I have no patience for chopping chocolate so I used Trader Joe’s semi-sweet chocolate chunks from their baking section of the store. They are about the size of a Pez candy or maybe a tic tac. That worked great for me and reduced prep time. These are awesome – wont replace the typical chocolate chip cookie – but a great variant to add to the repertoire. I used European salted butter plus a little unsalted to make up the difference for what I needed. Mine turned out kind of square, but that’s ok! I made these, but had issues with cutting them as others have. I’ve gotten good at making those, and they never fail. When I tried to cut these, the middle of the log stayed together, more or less, but the ends didn’t. I didn’t want to throw away the mix, so I formed those into mutant cookie creatures that aren’t very pretty but still taste good. Why do we want cold butter if we’re going to beat it with the sugars until light and fluffy? I used an electric mixer – hand held – and it was difficult. I made these today and they came out great. I used the full amount of butter called for in the recipe and used Land O Lakes “European Style” butter. I creamed the butter by itself for a minute or so before I added the sugars. I also just scooped the flour from the bag with the measuring cup and leveled it off. I did not do the egg wash or sugar on the outside, but left them in the fridge for about 2.5 hours and then (gently!) sawed off slices with a serrated knife. The only times the dough crumbled were when I hit a chocolate chunk and I was able to piece it back together. It seems most people who are having success in the comments are using a serrated knife. I think if you cut straight down with a regular knife your dough is more likely to crumble. Thanks for the well-written recipe and multiple tips in the comments section! For anyone wondering, as I was, whether you can make these brownie-style in a pan, the answer is yes you can. In this way you also avoid the crumbly dough togetherness issues. I made the dough, pressed it into a round pie pan, brushed the top with egg wash, sprinkled a little sugar all over and bits of salt in selective tiny clumps. Baked about 45 minutes, sliced it up, and it was enjoyed by all. I normally make shortbread in a square pan but that pan was occupied (by regular shortbread; it was for a crowd) hence the pie plate. But next time I will use the square metal pan for this. Perhaps something was lost in crispy cookie texture but it sure was easy and still was darn delicious. After reading through the comments, I had success! I used slightly softened Vital Farms butter (cheaper than Kerrygold) and since it wasn’t quite enough, I added a bit more from my fridge to make to about 255 grams. I only had my hand mixer but made sure to mix well enough so that the sugar/butter mix was fluffy. The thing that made it all come together I think was hand mixing (or kneading) the flour with the butter/sugar. I had very little crumbling of the dough, both while I put the dough in the parchment paper and while I was cutting. Also, I chilled the dough for about 24 hours or so. I think the egg wash was a nice touch but really did not need the raw sugar. Overall a VERY good cookie and I loved the chocolate chunks to cookie ratio. I do love a more chewy cookie so these probably won’t replace my favorites but they were easy to make and I can’t seem to stop eating them. Tried this an they were delicious (the raw dough tastes so similar to Ben &Jerry’s cookie dough pieces… they may never find their way into the oven again!). But… I had major spreadage with 250g butter and 295g flour. I halved the batch to bake again two days later (to see difference in regard to crumbling) and took the second half out of the fridge, let it warm and kneaded in a table spoon more flour. Less spreading, but still some. So next time (yes, there will be a next time), I think I’ll add three table spoons of flour the whole recipe and weigh it to see how much that comes to. And then decide how I like them best. I made a Valentine version for my mom and sisters, using red sanding sugar, and rolling the dough into a heart shape. The 5 of us gobbled down half a batch in one sitting. I parceled out the rest to friends; everyone has raved about these little morsels. I’d post a picture, if I knew how! baking so I originally misunderstood Deb’s instructions to “mix flour until just combined” to mean barely mix it at all, which resulted in that crumbly texture. Anyway, I hope that helps! I’m very happy (and so is my boyfriend) that I gave these a third shot since they are so so so good!! I made these a couple of weeks ago and while delicious, they did spread a bit much during baking and ended up with a weird shape. I guessed it to be the butter to flour ratio and I´ve just confirmed it. I used a scale and use the gram conversion you provided, but I´ve just seen Alison do the recipe and she scoops the flour straight from the container, not spooning it, and she says her cups of flour normally weight 145 grams each, which would bring the total amount for this recipe to 326 grams instead of 295 grams. Just in case you wanted to ammend the recipe with that information in mind. The question about the flour measurement is interesting!! Deb, can you let us know what you think? I’ve always used the 326 g of flour with the 101 and 55 g of white and brown sugar. Beat on stand mixture 5 minutes, add four and choc. Beat a tad and knead it a bit. Comes together like dough for me, very little spreading. Wonder why results are so different…. I made the second batch after they sat in the freezer overnight. A sharp non-serrated knife worked better for cutting the slices. After resting in the freezer they cut much more easily and baked up very well. We went overboard and drizzled some leftover chocolate ganache on them when they had cooled. They are amazing, crisp edges, buttery, delicious. But they won’t take the place of the consummate chocolate chip cookie. So I initially made these close to 2 weeks ago–baked off one log and left the other one in the fridge. I came back only tonight and remembered the other log. Was initially worried I had left it too long, but no! The dough sliced better, and baked up fabulously! Even better than the first batch. So, let my forgetfulness be of use to you–these are wonderful to have stashed for a rainy day. I actually had a log in the fridge for a two weeks too, and found the same. No harm at all. I think I’m the only dum-dum who used unsalted butter without adding salt and not salted butter! I automatically reached for the unsalted butter as that’s what most recipes called for. By the time I realized my mistake it was too late to add salt. So I tried to compensate by sprinkling extra sea salt. Needless to say, they’re ok. Other than overlooking the very important salt factor, I had no problems. I used cold tillamook butter and froze the dough for 40 min before baking. Can’t wait to try this again, but the right way. I love this recipe – this is my new favourite cookie recipe! Not sure more comments are needed, but I’ll add my experience. I used Kerrygold butter, plus a little unsalted to bring it up to weight and Lindt 70% chocolate, roughly chopped. My butter sat out for the 30 minutes between getting home from the grocery store and starting to bake, and by the time I finished creaming, it was near room temp. I mixed the flour in long enough until it was easy to form a log. First log was frozen for 2 hours, hard to cut. Second log, taken out of the freezer and into the refrigerator overnight, easier to cut. Use the cling wrap that covered the logs when chilling to hold them while slicing to get a better grip on the egg wash and sugar coated log. Baked in a convection oven at 350, ~ 16 minutes for the frozen dough and 14 for the dough from the refrigerator. No spreading at all. My texture was great, flavor excellent, but I prefer my regular chocolate chip cookie nonetheless. I decided I like my shortbread with more subtle flavorings than chocolate. The family agreed, but every last cookie was eaten quickly, so it wasn’t like anyone was actually complaining. hi all—I’m desperate to make these cookies, but unfortunately I’m a college student devoid of access to any electric mixer. Any chance I could somehow make this work with more accessible tools (i.e. wooden spoon, strong arms, empty beer cans)? i would say no, you need a mixer. stand or hand mixer. :P you need to mix the sugar and butter REALLY well. There was a really funny article about this very question! See link! I made these and they turned out absolutely perfect. I used a stand mixer and beat the heck out of the sugar/butter/vanilla mixture until it was light and fluffy. I had no problems with crumbly dough, it pressed together quite easily. They tasted awesome, the sugar edge adds a really good crunch. I couldn’t get the sugar to evenly coat the log so I rolled the edge of each slice in the sugar again to get good coverage. These are absolutely perfect! No problems with the dough–I doubled the batch in order to use up a pound of Kate’s that I had bought for these, and added a bit of Kerrygold to round out the difference. It did take about 9 minutes in my Kitchenaid stand mixer to get what I think of as “light and fluffy,” starting at a lower speed, and getting to about 6 halfway through. I did accidentally roll the logs in the turbinado sugar before freezing them, and so I skipped the egg/sugar application later. The sugar stuck very well, and was noticeable, so i might stick to that just to streamline the process. One log baked, four frozen for…emergencies. Thanks for sharing! I read all the comments below about crumbling and spreading out. I’m also too lazy to make the logs. So I made the dough, pressed it into a quarter sheet pan, and put it in the fridge over night. I woke up, put on the egg glaze, sprinkled it with the salt and sugar, and baked it for 30 minutes. I let the pan sit for 5 minutes then cut them into squares. Once cooled, they were perfect and a huge hit at work- lots of requests for the recipe! Thank you!! Has anyone tried to make this recipe gluten free? Normally my cup4cup works great but these just spread everywhere! Still delicious but crumbly and thin. I am having so much trouble with these but am determined to get them right. The first time they were too crumbly (beyond salvaging) which I think was because I didn’t beat the butter mixture long enough. The second time I beat the butter for much longer and they stayed together more but were still crumbly and didn’t stay intact well enough to slice and bake. I’m in Denver so don’t know if the altitude is a factor. I’m wondering what you’re thoughts are on adding an egg to keep them together or if you have any other recommendations. I just baked these and were very happy with how they turned out. I was afraid of the crumbling as that has happened to me in the past with making shortbread. This time I used cold butter, and mixed with sugars for like 7mins = no crumblings! i found it to be slightly too sweet, so I’ll use a little less sugar next time. they also didn’t grow or flatten out in size too much. baked it for about 14mins. i did not use the egg and i used unsalted butter. Wow. These are incredible. Actually even better when they cool and get crunchy. Make sure to beat the sugar and butter for a long time, then your dough is easy to work with. These are an actual dream. I made them 3x and in the last batch, switched out 1/3rd of the butter for brown butter. DO THIS — and maybe cook them for 15 minutes instead of 12. Hi Debbie. I have made these several times, but i accidentally just made a double batch and forgot those extra two tablespoons of butter per batch. Will they still turn out, or should i dump it? thanks. I’ve made these delicious cookies 3 times. Crumble issues? Don’t give up, you’ve got this! Try this: grate cold butter into mixing bowl, sprinkle sugars over grated butter so it sifts down into butter, add vanilla, cream with paddle mixer as stated in recipe. Add flour to creaming mixture in 1/2 cup amounts, scraping down occasionally & dough starts to come together in big clumps, stop. Add chocolate chunks and mix until just incorporated. Now: my trick for making logs, lay your plastic wrap out, use an ice cream scoop (mine is 1 1/2 “diameter), and fill with dough, lightly packing against the side of your mixing bowl, place your scoop of dough on the plastic wrap, next scoop using same technique, place dough pushing lightly against previous scoop and make a “caterpillar”, when the log is at a length that’s workable for you, use the plastic wrap to lightly push the dough together. Wrap and form the dough, smoothing with your hands, any cracks can be dealt with when you slice it, by just pushing it together. After chilling, sugared edges or not, slice with a finely serrated knife, holding the end of the log lightly as you slice. Any crumbles can be easily pushed back into place. Bake as directed. I used salted Challenge butter, GM unbleached flour, Ghirardelli 60% chocolate bar (chopped). 11 -12 minutes @350 to bake perfectly. Colorado baking @ 5000 ft. Delicious cookie! I made these with dark chocolate chips and rolled the logs in light brown sugar rather that demerara and they came out great. For those having issues with crumbly dough, be sure to SPOON the flour into the cup and level with a spatula rather than dipping the cup into flour. You can get up to 20% more flour by the dipping method. Also, be sure to thoroughly mix the butter and sugars, about five minutes, to get the light, fluffy consistency. Yummy cookies! I will make these again. Just made these, following directions & recipe to a T. They were in freezer for over one hour. Dough was never crumbly, was more sticky. Result? Cookies spread all into one giant mess! Thank goodness for parchment paper!! Was there ever a resolution to why people had the “big spread?” I am more than a little disappointed. My butter was cold to start with, not European butter. Thank you!!! I love short bread cookies which taste even better with tea in my opninion. Adding choc chips can only make them better. Great recipe! I agree that it’s hard to find the perfect choc chip cookie recipe. I only had 2 sticks of butter so I used some avocado oil to make up for the 2 additonal tbs the recipe calls for. (I had already started the process before I realized I was short. Amateur mistake, I know.) I think the cookies I made are good but nothing spectacular. Maybe the taste will change if I let it cool a little more. The chocolate chunks made it hard to slice the log in pretty, even cuts. Since I didn’t follow the recipe to a T, I think it’s worth trying again. Even if my second attempt turns out similarly, my takeaway will be the rolling of the log in the sugar. It creates a nice crunch. These are very good, even though I didn’t quite follow the directions. I used a scoop and baked right after I made them, still very tasty. I also beat the butter/sugar/vanilla and flour probably a little more than you think you need to, and they held their shape very nicely. I also let the beaten butter/sugar sit for a bit and I think that helped. So I have the log chilling in the refrigerator, just jumped on my treadmill, to burn off the calories of a cookie before I have one, : ) was reading the recipe again on my I pad, realized I only used one cup butter, forgot to add the 2 tablespoons… what affect will this have? The mixture was crumbly, and formed nicely into the log though? Curious, my mom just made these and they taste fantastic. However she’s very disappointed because they came out very wide and flat like little crisps. She was wondering about the butter portion. It’s so baffling. I’m sorry I haven’t gotten to the bottom of why it’s happening for some people and not others. I weighed my ingredients and the cookies also spread, not thin like crisps but the edges did not remain squared off and they look more like regular chocolate chip cookies. Still delicious! I just made these. My husband doesn’t like chocolate but the kids and I do, so I used only 4oz instead of 6 and I thought they were too chocolatey. But this is just a matter of personal preference. My dough came out perfect and they baked up nicely (18 min or so). They cooled to perfect texture. I made these last night. I did use Irish butter, and stand mixer. I didn’t have flaked salt, so I used a grinder and used a couple grinds in with the demerara sugar I rolled them in. I did make the logs smaller, so I got 18 cookies from half the batch. They are incredible, and I can’t stay away from them! I guess I’m a little late to the salted butter chocolate chip shortbread cookie party – I had been away from home (thus, my kitchen) for the last three months – but I pulled together a batch of these today. First, after reading comments everywhere about how crumbly this dough was supposed to be, I was amazed at how smooth mine turned out. (This is very close to the flour/ butter ratio of your standard chocolate chip cookie recipe, but minus the eggs, which also led me to expect crumbly.) I used all 255 g of butter called for (I also used the Chimay someone mentioned below) and maybe a bit more vanilla than 1 tsp. I also use baker’s sugar, which I have noticed yields smoother batters/ doughs/ whatever. I routinely make cookies similar to this – cookies shaped into logs, rolled in something, then sliced and baked – and I never use an egg wash. Lime pistachio thin cookies get rolled in chopped pistachios when the dough comes out of the bowl; logs of refrigerated sablé dough get rolled in coarse sugar as is. A little pressure, and the sugar embeds in the dough. Here, I took the soft dough, rolled logs (I made three) in the sugar, and tossed in the fridge…where they sit now. I can post again after I bake them, but I think they’ll turn out just fine! I found these cookies to be rather underwhelming for all the hype around them. For an average cookie I would say they’re ok but far from my favorite choc chip cookie. I used European butter; my dough was crumbly but came together fine upon mushing it into a roll in parchment paper, & they cut ok & baked without spreading. I just found the egg/sugar step to be rather fiddly (that plus chilling=extra work, in my book) & I don’t think they taste all THAT amazing compared to other cookies I regularly make / for everything I’ve heard about them. We’ll finish them, but it’s not a recipe I’ll be making again. Amazing cookie. I am a cookie fanatic and this is now a real favorite. I love your blog! I had the problem that many have described of having a dough that was far too crumbly. I sprinkled in a couple of teaspoons of water and worked it in with my hands. That was enough to make the dough form up into a log, and stay formed throughout refrigeration. They turned out sliceable and bakeable and delicious. I haven’t just made these. I’ve made them over and over. They’re incredible and everyone loves them. I have no trouble with the recipe. I don’t weigh the ingredients, I just use the cup measurements. I know that’s not the purist way to bake, but it works for this recipe. Thank you so so much! Making these for Easter brunch! I had 3 people in one week mention these cookies to me and I’ve been meaning to try them! I made these with the weights specified and they’re amazing. I did beat the sugar and butter on high for several minutes, if that helps anyone. These are going to be amazing hostess gifts for my two Easter dinners. Holy cow these are amazing. The only thing I would consider doing differently is making them slightly smaller – 1.5 – 1.75 inches instead of 2 – since they’re incredibly rich. Then I could justify eating two! I used Kerrygold unsalted butter and added the 3/4 tsp of salt. The cookies tasted bland. Next time I’ll try salted butter. I would not recommend doing this without the right kind of butter. Can you freeze these to make later? I would feel comfortable freezing these cookies WITHOUT the sugar coating – the sugar coating won’t do well in the freezer. Other than that, these are very similar to other cookie doughs I have frozen successfully in the past. Would these be good with crushed potato chips added to the batter? Should I reduce the salt if I do that? My cookies were flat also! Does anyone have a suggestion for this? I just want to say – I’ve made these a million times now and they’re so incredible. I didn’t think my love for traditional chocolate chip cookies could be shaken, but these cookies are beyond. Also, I can’t believe I’m saying this, but, while these cookies are amazing fresh out of the oven, they may actually be even better the next day? I know, it sounds insane but it might just be true. I made these as a Mother’s Day treat for myself, and they are one of the best cookies I’ve ever had. I used unsalted butter and added kosher salt as suggested and used chocolate chips instead of chunks because that’s what I had on hand. They spread a little more than I anticipated, but I didn’t wait the full two hours before slicing and baking so that’s my bad. Seriously so delicious. Many thanks for sharing this recipe! I’ve made these multiple times as thank-yous (bribes? )for coworkers! I usually buy a block of Kerrygold and then use a pat of regular butter to make up that last 5 grams, with great success! The first time I made these hey were amazing. The second time they are awful. Not sweet at all. Did the recipe change? These are “to die for” good! I try to keep some in the freezer to bake when I need something sweet. They don’t last long! Did you have any problems making shortbread cookies? My daughter wants them but look like reviewers had problems with dough and chilling ?? I had no problem making the dough at all. It chilled for a couple of days – I remember rolling in plastic wrap. My daughter obviously did not have trouble with the slicing and baking. I can’t say she did the egg wash or not. I will say I substituted the chocolate chunks with what she had on hand – chunks and chips! These cookies are absolutely perfect! Love everything about them. Thanks Deb! I just made these today for about the 6th time and they spread all over the place. That never happened before. I chilled the dough for several hours, always did it overnight before. Anyway, they look awful but will taste fine I’m sure…just not very good looking. Do you sprinkle the salt over the cookies after you baked them? A few flakes of salt go on before you bake them. My technique is to use a food processor instead of mixer, it really works well with chilled butter. Make sure to still get the sugar/butter mix light and fluffy before you add the flour. I think weighing out the ingredients or being very careful about measurements is the key to getting the dough to come together instead of a crumbly mess. If you want to avoid the egg wash, you can smoosh the dough into a log on parchment and roll it in sugar before chilling it. My boyfriend is allergic to eggs and loves cookies so this is a great sub for basic chocolate chip cookies! This is a VERY FORGIVING DOUGH. I lost track of the dough rolls in my freezer for 4 months. I left them on the counter for 45 minutes, rolled them in sparkling white sugar, sliced and baked them for 15 minutes, and they were perfect. A special bonus for me: this is the lost recipe my mother made in the 60’s except hers had lemon zest and raisins instead of chocolate chips. The lost has been found. Hurrah! Made these tonight and was worried because my dough wasn’t really dry or crumbly. But they came out perfect! I weighed both butter and flour, froze the dough for 30 minutes then let them chill in the fridge for an hour or so before cutting (the chunks did make them fall apart a bit, but it was easy enough to smush em back together) and doing the egg/sugar/salt finish. I also did chill my cookie sheet in the freezer for about 10-15 minutes because I feared they might spread. But no spreading and they definitely did have a shortbread-y taste/texture. So tasty but very rich. Yum! Just popped these into my fridge to chill. I Definitely beat the butter and sugar for about five full minutes to ensure I didn’t have unmanageably crumbly dough. I was able to squeeze it into a log with parchment wrapped around it. I am a long time smitten kitchen fan and decided on this recipe for a less sweet dough as I chopped up numerous aero bars from my kids’ Halloween haul. I know it called for semi sweet/bittersweet so I hope it’s not too disgusting with milk chocolate 🙂 thanks deb yet again. i had all the same problems the people below did. o triple checked my recipe. guess we need to use european butter. i am going to attempt to. air the crumbs? validation seeing that i’m not the only one who followed the recipe to a t and had a fail. I creamed the butter and sugar for 10 minutes in my kitchenaid on high – no issues with the dough at all. I also put the dough in the freezer for 30 minutes and the fridge for 30 minutes before baking and rolled in crushed hazelnuts instead of sugar. Minimal spreading and no crumbling. Very short biscuits, thanks Deb! These are delicious! A perfect and quick make ahead recipe that I can throw in the fridge a day or two ahead of time. When I’m ready later, I have beautiful, tasty cookies fresh from the oven to impress guests (and myself, yet again) with! LOVE these! So simple and so insanely good. We skip the egg and just press the raw sugar into the edges. It works almost as well and saves us an egg during winter when eggs are scarce. AMAZING! I wanted to try something different for Christmas, so I made these. They are crazy good. I made the dough logs last night – and baked the cookies this morning. The tiny flakes of salt make a big difference. These are easy to make and are well worth it! 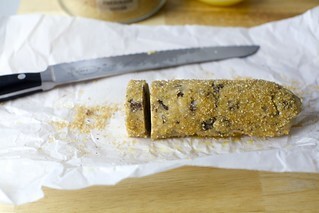 Rather than egg wash and sugar the outside of the log, slice the cookies first. Then egg wash and sprinkle sugar on each slice before baking. This allows you to re-form any cookies that crumble apart when you’re slicing (without losing the crunchy sugar coating). And I found that freezing my slices for ten minutes before baking was an enormous help for the spreading problem. I chilled the logs for 2 hours, sliced the cookies, then put them in the freezer while my oven pre-heated. No more over-spreading! These turned out perfectly! I couldn’t be happier with them. I made them as Christmas gifts for family and friends but I’m now regretting not making more for myself! I didn’t have an issue with the dough crumbling when I sliced it – little pieces came off and were easily pressed back in. I refrigerated it for 24 hours as it’s summer in NZ and the humidity is ruining my baking and I was glad I did! I tried to dip, sugar and slice as quickly as possible so the dough didn’t warm and then baked them for 15 mins. My father, who doesn’t like “American-style” biscuits (cookies) ate three. Thank you for yet another perfect recipe! I just baked these off and they are delicious. I was wary after reading all the trouble many people had with the dough. I didn’t have any issues. Yes, the dough was a bit crumbly but if you just smush and roll it into log shape that works. I refrigerated mine over night. I have a large serrated chef knife and I used that to cut the cookies. Instead of sawing, I just quickly and with force chopped the 1/2 slice off the log. The quicker and harder I did so, the less it wanted to crumble apart. I baked for 13 minutes. YUM!!! I have made these a few times, and they are a big hit. I do have to admit, though, that the slicing can be quite difficult since I typically make the dough ahead of time and freeze it. I HATE when my hands are sticky/messy, so I have mixed up the egg/sugar, slicing step. I tried to use my big serrated bread knife for slicing, but I must be missing some vital muscle group because I am literally breathless and sweaty when I try to saw my cookies. Instead, I use my biggest chef’s knife and just press with two hands. Then, I roll the edges of my cookie in the egg and then the sugar. I am no longer huffing and puffing, and I don’t feel the need to wash my hands every 3rd cookie. The bonus is that there is much more raw sugar on the edges of my cookies because my sweaty gross hands haven’t wiped it off while sawing. Happy baking!! I made these last night. I weighed the flour using Deb’s measurements. I hadn’t read the comments before I cooked them. I used the correct amount of European butter. I had left it out to room temperature before I read the recipe and then stuck it in the freezer for about 20 minutes before I used it, but I am wondering if it the butter wasn’t cold enough and that had an impact. I used a stand mixer. I had a little trouble getting them into round logs, but they weren’t crumbly. My logs just kept coming out square. They were in the fridge overnight and then I cut them this morning. I had no trouble slicing them. They did spread quite a bit in the oven. And I probably cooked them for about 19 minutes before I gave up. I still think they may have been under. Sometimes I’m waiting for them to look right and it ends up being totally overcooked when you taste them, so at 19 minutes, I got antsy and took them out. I only cooked one of the logs, so I’ll be curious to see if the second log comes out differently. Ok, first batch I made were so crumbly I had to throw it away! But, I persevered and tried a second time. After reading the comments, I suspected that I hadn’t sufficiently creamed the butter and sugars (thinking my ingredients were too in my winter kitchen). For round 2, I let my butter soften a bit and beat everything for probably 6-8 minutes just to be sure, and it made a huge difference. The dough was still crumbly when I made the logs, but I had no problem cutting with a sharp serrated knife after a few hours in the fridge. I’ve been following you long enough to know that the next comment I make may spark incredulity in you – I’m not a great fan of chocolate. I know, I know – hard to hear. I don’t dislike it, but I don’t crave it and for the most part am a sweet/tart lemony kinda girl and will follow my nose and heart to something with lemon and berries, where my mouth is waiting to dive in. I make these cookies for others, especially family members who crave them, and when making for just my husband and me, I submit the following adjustments. I split the dough in half before adding the chunks and creating the logs. The chocolate goes to the hubs’ dough. (He loves me. A lot.) I add the remaining shards AND chopped, toasted pecans to my dough. Just enough chocolate with the toasted nuts to enroll me completely in the recipe. Then logs, etc. And everyone is so very happy. Thanks for this terrific recipe! These might be my favorite cookies. Ever. 5 stars, A+++, 2 thumbs–any way you slice it (no pun intended), Deb’s chocolate chunk shortbread are always a hit. I followed the recipe exactly and it was so crumbly I could form it into anything. Any suggestions for when that happens? Could you press it into an 8 by 8 square cake tin to make a kind of shortbread in a pan that you then cut into pieces while it’s still warm? I don’t know if that would work or not. From experience and all the other comments, it seems the key is really beating the heck out of the butter. I put a timer on, drape a tea towel over the kitchen aid so it doesn’t splatter, and go do something else for the 5+ minutes it takes. I have made these 4 times (once from here, twice from Alison’s cookbook, and then once more from here), and it was only on the 4th time that I did NOT see spreading. I rarely struggle with recipes which was why I didn’t want to give up. The two changes I made for this 4th, successful batch, was to use a normal, non convection oven, and to use NORMAL WHITE sugar, not the natural sugar I use most of the time. I think it’s the sugar that made the difference TBH. as if there were anything more to say about this cookie, your additions, as always, were notable and fun to read! This is an amazing recipe, but sometimes I am too lazy to roll the dough into logs. So, I just press it all into a 9×13″ or 8×8″ pan, sprinkle the sugar on top, let it rest for 30-60 minutes (or not), and bake them as bar cookies. I bake at 325 — the 9×13″ pan for 30 min, and the 8×8″ for 35. But keep an eye on them starting at 25 – since ovens vary. Score them as soon as they come out of the oven, because they harden! Like Deb, we like tiny bites of things, so I score them pretty little. Just a tip in case you feel intimidated to bake them otherwise! I could not slice mine without the dough falling apart. Not sure what I did wrong. hi maggie,,,, i just stumbled on this recipe and comments, and have made these via the New York Times cooking website, the author is still the same, but the recipe is written with more detail. i have read all the comments before yours, and alot of people are having problems…. if you follow the recipe from the NYT, you will have no problems….. I want to make these cookies but if I go to the link you sent from NY times cookbook, I cannot get recipe without joining NY times. Is it possible to send me the good copy of the recipe??? These were a huge hit at the Super Bowl Party tonight. I made a double batch and they were fighting over the very last cookie! This may get buried because it’s an old post, but is the butter fridge-cold instead of the more usual room temp? I left them a little longer in the oven till they turned a little crispier and it was the best damn chocolate cookie I’ve ever made. Received lots of raves on this recipe. My bestie and I are having our annual Palentine/Galentine/ Gaylentine dinner on Sunday to go along side classic chocolate mousse for dessert. I usually freeze my butter, as I don’t bake weekly. I forgot to take out my butter, so opted to make them in the food processor. The dough came out perfectly, not too crumbly. I rolled them into”heart shaped” logs, they are now chilling. Going to roll them in espresso sugar. The dough is delicious! I will bake them later tonight or Sunday morning. Why did I wait so long to make these? I rolled them this morning. I sawed a few off the log tonight . They might be the best cookie I have ever eaten (and I have eaten a few.) I can’t get them out of my mind. So I’ve made these twice and both times the cookies spread. Delicious, but thinner than Deb’s. The cookies were cold when they went into the oven. Any ideas why? I heard about this amazing article have you seen this introductory speech here. We make such excited tips on picsart photo editing hope you would found this..
Just thought I’d update my comments since I made another (well, maybe a fourth or fifth batch) of these and still have had no major crumbling issues, or spreading issues. I’m very much a recipe follower and don’t substitute things, but this time I \made a few minor tweaks which made MY life easier. I still just measure, not weigh, and use the cheapest butter at the grocery store (2 sticks plus 2 Tablespoons, cut on the line on the wrapper). I do soften my butter to room temp, cream the butter alone first and then with the sugar for good while, and when I add in the flour I mix (stand mixer) well, until it holds together. I used Ghirardelli dark chocolate chips this time, because again, mess-avoidance and it was midnight). I rolled out the logs and decided to roll them in turbinado sugar while warm, no egg wash (because it was so messy trying to get egg was to stick to cold dough rolls) and then……I sliced them (with my Frugal Gourmet bench cutter) while warm. Yes, they kind of squished into rectangles, but I reshaped those that needed it, and my grandsons don’t care. Arranged on cookie sheets and chilled until 6 am when I baked them. One pan out at 15 minutes, the other that danged Alexa didn’t set the timer as I asked and they went to twenty, but were fine. No crumbling, no spreading beyond normal, and only four cookies left! Cutting that chilled log was just too much of a pain, and this way worked just fine. I’ve made this recipe twice now, and I’ve found that both times, I’ve had to add an egg to the batter (not just do an egg wash) to hold everything together. What am I doing wrong? My batter definitely doesn’t look like yours above when I go to shape it into a log. Help! Thanks so much for including metric measures in your recipes. It makes things so much easier for me because as a European the American measuring system can sometimes seem a bit baffling. Also, I love your recipes because they are so reliable and forgiving that every one I’ve ever made has turned out at least ok and sometimes really super. This one definitely falls into the ‘really super’ category! Love this cookie! I’ve made this several times but have always been frustrated by the slicing step — the cookies invariably crumble everywhere while I’m sawing the log into slices and I end up spending an inordinate amount of time piecing them back together. Not that anyone’s asked but what I’ve found easier to do is instead of rolling the dough into logs, I’ve started pressing them into a square cookie pan lined with baking paper, then wrapping the entire pan with plastic wrap and refrigerating as per usual. Then when the 2 hours are up I just pop the dough out of the pan and cut into neat squares. Et voila! No fuss, no muss. Also I get to skip the egg coating with sugar bit because I find the cookie plenty sweet on its own. Hey, am I missing something? says butter should be mixed cold, but then the end result should light and fluffy. Everything I ever learned in baking was that butter needs to be soft to achieve that result. Confused, please help. 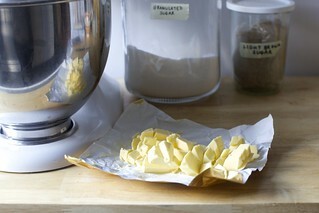 A stand mixer can soften and whip the butter, even if cold, just takes a few minutes. Alison Roman recommended 10 full minutes; I found I could get away with less.